In the aftermath of Lincoln’s assassination, the authorities (both federal and local) took up the task of hunting down and collecting conspirators and evidence. Lincoln’s own wartime policies gave investigators unprecedented power to arrest and confiscate persons and things relating to his assassination. While casting such a wide net did succeed in capturing the members of Booth’s inner circle, it also inundated the War Department with mountains of evidence. Secretary of War Edwin Stanton appointed three army officers; Colonel Henry Wells, Colonel Henry Olcott, and Lieutenant Colonel John Foster, to help manage and assess the ever increasing paraphernalia. In turn, they reported to Colonel Henry Burnett, who sifted through their materials to find the key evidence to be used in the trial of the conspirators. The voluminous paper materials can be found in the edited book, The Lincoln Assassination: The Evidence by William Edwards and Ed Steers, while the original documents can be viewed online (and for free) at Fold3.com. This investigation, however, centers more on some of the collected artifacts found by the War Department: the knives. During the initial round of evidence gathering, many edged weapons entered the War Department. A knife was collected from the home of a Ms. Mary Cook, a known Confederate sympathizer, who continually celebrated after the assassination and tore down the mourning crepe placed upon her abode. Another knife was taken from a Sergeant Samuel Streett, an acquaintance of Michael O’Laughlen, who was accused of passing two women through his lines at Camp Stoneman on the night of April 14th. A sword was removed from above the mantle at the home of Mary Surratt. 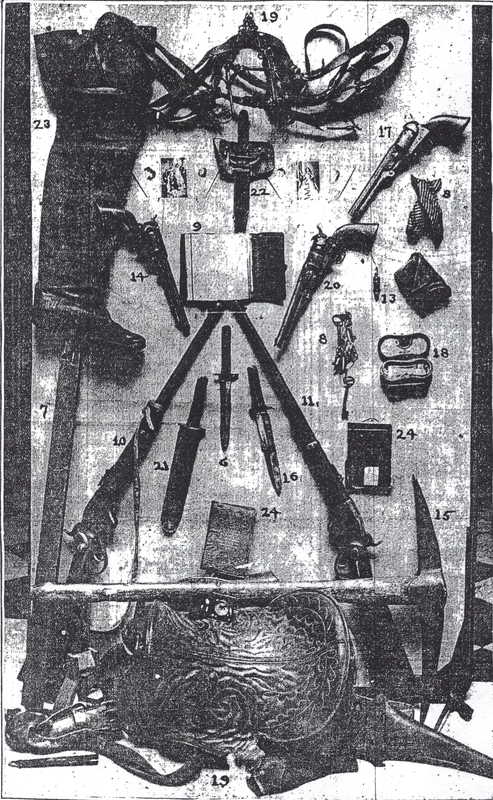 In addition to these unrelated weapons, the investigation also managed to acquire the weapons of the conspirators. A knife was found hidden underneath the sheets of a bed at the Kirkwood rented to George Atzerodt. Samuel Arnold was arrested with a knife. Knives belonging to both Lewis Powell and George Atzerodt were recovered on the streets of D.C. the morning after the assassination. Finally, the lead conspirator himself gave up a knife when he was shot in the Garrett’s barn. All of these knives, along with others not mentioned or as fervently documented, left the members of the War Department up to their knees in knives. Therefore, Colonel Burnett began his process of identifying the important items he would need in the trial of the conspirators. The selection of which knives to use as exhibits was done very skillfully. With the evidence before him, Burnett realized that, out of those involved in the actual assassination plot, the government’s case was weakest against George Atzerodt and Mary Surratt. Therefore, their blades were touted right along side that of the assassin’s. During the trial, the first three knives were identified by their finders. Detective John Lee discovered the knife pictured above at Atzerodt’s room in the Kirkwood house. It was hidden, “between the sheets and the mattress.”  While found in his rented room and bed, the contents of Atzerodt’s “lost” statement indicate that the knife, along with the other contents found in the room, belonged to David Herold. Further, the statement of Mrs. R. R. Jones (the wife of a bookkeeper at the Kirkwood) notes that, a little after ten o’clock on the night of the assassination, a man ran rapidly past her room, towards Atzerodt’s, and tried to open the door of a room “three different times”. Not being able to get in, the man ran back past her room and down the stairs. This man is supposed to have been Davy Herold. He left his coat, knife, and pistol in Atzerodt’s room, and came to retrieve them for his flight south. Upon finding the room locked and empty, Davy assumed correctly that Atzerodt had lacked the courage to complete his task, and fled. This could explain why, at the Surratt Tavern later that night, Booth bragged to John Lloyd that, “we have assassinated the President and Secretary Seward.” He did not include the death of Vice President Johnson in his boast, as Davy had likely reported the locked and empty room. While the above scenario is just a theory, it is safe to say that the bulk of the contents in Atzerodt’s room at the Kirkwood were under the care of Davy Herold, including the bowie knife recovered. From this point on, the knife found by Detective Lee, probably belonging to Davy Herold, will be referred to as the “Kirkwood knife”. This will eliminate confusion between that knife, and the knife pictured below that Atzerodt himself tossed into the gutter after hearing the news of the successful assassination. By the afternoon of July 7, 1865, all of the owners of the knives used in the trial were dead. The knives, along with the other pieces of physical evidence, were boxed up and stored. A year later, a request came in to the War Department from Secretary Seward’s former male nurse, Private George F. Robinson. Robinson was asking for a unique keepsake: he wanted the knife Lewis Powell used to stab him and three others. After being approved by Edwin Stanton, the knife was turned over to Robinson, the lone hero on that night of villainy, in July of 1866. Even though Powell’s knife was given to Robinson, this did not affect the four exhibit knives as Powell’s was not one of them. This fact is important to note. Much of the later confusion regarding the assassination knives comes from the assumption that the government retained possession of Powell’s knife. They did not. From 1866 to 1961 the knife was in the possession of the Robinson family. In 1961, the knife pictured below, along with other papers belonging to Private Robinson, were donated to the Huntington Library in San Marino, California. The knife still resides there today. Many journalists and researchers would include Powell’s knife in the government’s holdings during the late 1800’s and early 1900’s, and all would be incorrect in this matter. In 1867, the trial of John H. Surratt, the escaped conspirator, began. The evidence boxes were reopened and many of the same witnesses from the initial conspiracy trial were recalled. The civil trial ended in a hung jury and Surratt was set free. About six months later, another trial was held and the assassination of Abraham Lincoln was relived in that court room as well. That trial also acquits its defendant, President Johnson, who narrowly avoided impeachment. The assassination evidence, now having been taken out, examined, and disorganized twice since the conspiracy trial, was boxed up and stored again. This time, the storage lasted quite awhile. In 1880, Representative William Springer of Illinois was one of the first to try to claim some of the Lincoln assassination artifacts. He introduced House Resolution 178 on January 23, 1880 calling for, “certain books and mementos in possession of the government to be placed in Memorial Hall of the National Lincoln Monument at Springfield, IL.” It was quickly passed in the House and a Chicago Times journalist reported that it “will no doubt pass the Senate in a few days. The articles called for by the resolution are now in the office of Judge Advocate General Drum, in the War Department, and upon the passage of the resolution will be shipped to Springfield.” While the resolution was eventually passed in both the House and Senate, the annual reports from the National Lincoln Monument Association in 1882 reflect what little became of it: “Concerning relics to be sent from the War and State Departments to Memorial Hall, the only article received thus far is one copy of, ‘Tributes of the Nations to the memory of Abraham Lincoln,’ and is the only one that can be spared. Hon. W. M. Springer has been untiring in his efforts to have the provisions in the joint resolution complied with, but obstacles have presented themselves at various points, and the probability is that we will never receive half of what was ordered in that resolution.” Despite a resolution from Congress, the artifacts and knives stayed in storage as they were deemed too important to let go of, at least for now. In May of 1899, Judge Advocate General Guido Lieber, was in the mood to do some spring cleaning. Particularly, he wanted to be rid of the trial relics: “These relics are now in a locked cabinet, in a storeroom of this office, in the sub-basement. Very frequently visitors obtain permission to see them, but, owing to the storeroom being filled with files, there are no facilities for showing them, and it takes the time of an employee of this office from his official duties for the purpose.” Lieber contacted the Smithsonian (then called the National Museum) and they were “very agreeable” to receive the relics. Lieber then received permission from the Secretary of War, Russell Alger, to transfer the relics under one condition: the artifacts would forever remain “subject to the control of the War Department.” The Smithsonian did not care for this condition and, during the confrontation that followed, the War Department decided that, “the law did not authorize even a temporary removal of the exhibits.” Again the relics stayed in the Judge Advocate General’s office. The exhibits of the assassination trials displayed for a reporter in 1908. Under the control of thirteen different Judge Advocate Generals, the identities of the knives became scrambled and confused. Powell’s knife was not in the government’s possession and therefore was not turned over to Ford’s. The four knives that Ford’s received are the same four listed in the trial exhibit list. While, at times, it seemed that they were going to be transferred elsewhere, they never left the JAG’s office and the number of assassination knives being held by the government remained unchanged since Robinson was granted Powell’s knife in 1866. Since 1940, the National Parks Service has been trying to sort through this mess of knives with varying degrees of success. Of all of the knives, the NPS has consistently been correct with their identification of Atzerodt’s knife and the Kirkwood knife. This is partially owing to the fact that the 1940 inventory correctly, but vaguely, lists these two as “Two knives secured from the effects of the conspirators”. If you would visit Ford’s today, you would see Atzerodt’s knife (FOTH 3234) and the Kirkwood knife (FOTH 3231) on display and correctly identified. The main problem and confusion with the knives lies with the assassin’s blade. At Ford’s there is the above pictured, ornately etched, double edged knife, manufactured by Manson Sheffield Co. of England. It is just less than 12 inches long with a textured bone handle. This beautiful knife has the words, “America”, “The Land of the Free and the Home of the Brave”, and “Liberty and Independence” etched on the blade. Due to this, Ford’s refers to it as the Liberty knife along with its artifact number FOTH 3235. Most visitors, however, know it by another name: Booth’s knife. According to the tag underneath it, this, “horn-handled dagger was used by John Wilkes Booth to stab Major Rathbone after shooting Abraham Lincoln.” No doubt, many have seen the irony of such a patriotic knife helping to commit such an atrocious crime. It makes a poignant impact on those who have seen it. Unfortunately, it’s also a lie. This is not the knife Booth used to stab Major Rathbone. This knife was not recovered from Booth at Garrett’s barn. This knife did not even belong to John Wilkes Booth. To explain this confusion, it is crucial to look back at the statements and testimonies of those who were with, and captured, Booth. After Davy Herold was caught at the Garrett’s he was transferred to the monitor, Montauk. Here, he gave a statement skillfully trying to conceal his guilt. Though much of Davy’s statement must be taken with a grain of salt, he does produce the following about his traveling companion’s act: “[Booth said] he struck him [Rathbone] in the stomach or belly with a knife. He said that was the knife (pointing to the one which had been shown to the prisoner).” Davy is stating that the knife recovered from Booth at the Garrett’s is the same knife he used to stab Rathbone. While Davy commits to this, he makes no mention of any ornate etchings on the blade of the knife. In fact, Davy, Everton Conger, Luther B. Baker, John “Jack” Garrett, and Boston Corbett all make mention of Booth’s knife in statements and testimonies, but merely describe it as a “bowie knife”. No mention is made of any noteworthy markings on the blade. The term “bowie knife” was used to describe any large hunting knife usually with a crossbar. It is similar to how a derringer, originally the specific maker of the firearm, came to refer to any small pocket pistol. “Q: Will you state what articles you took from him? A: …He had a large bowie-knife, or hunting knife, and a sheath. Q: Do you know whose make that was? “Q: How do you identify the knife? A: The knife has a spot of rust on it, about two-thirds the way from the hilt to the point, right where the bevel of the knife commences at the end. It was said to be blood, but I have never thought it was myself. It is the same shape and style of knife. Q: Have you not seen other knives like it? Q: Have you not seen a great many like it? A: No, sir; only a few. Q: You put no marks on it? A: No. I have no means of identifying it except by the description I have given. Q: You did not look at the name of the maker? This blade does not bear any engravings or patriotic slogans. It is identified with the name “Rio Grand Camp Knife” and a “spot of rust” said to be blood. This testimony identifying Booth’s knife raises a question. Since Booth’s knife is not the Liberty knife, from where does the Liberty knife come from? This question can be answered by looking at the exhibit list from the conspiracy trial. The Atzerodt knife and the Kirkwood knife are identified and accounted for, so that leaves just two: “Booth’s knife” and “Knife found at Mrs. Surratt’s House”. Since, through Conger’s identification of the knife he helped take from Booth, we know that the Liberty knife is not Booth’s knife, it has to be the “Knife taken from Mrs. Surratt’s house”. Aside from the description in the exhibit list and its corresponding tag from the JAG’s office, this Liberty knife from Mrs. Surratt’s is very elusive. The conclusion that this author has drawn, is that this knife was likely taken from Mrs. Surratt’s and never properly inventoried. This is not as unlikely as it seems. The Surratt boardinghouse was stripped of anything that could be used as evidence. In an inventory list dated April 24, 1865, the final item mentioned is a “Trunk and contents from Surratt House”. It is written in a different pen and lacks the numeration and specificity of the other items in that list. In fact, the only record of what was in the trunk comes from its return to Anna Surratt on August 18, 1865. The receipt, noting the return of three pistol cases, a sword, one box of caps and other items, does not mention a knife. However it should not mention it because the knife, as an exhibit, would have been retained by the government. While this is a theory, with the mounds of evidence procured during those days, a knife from Mrs. Surratt’s could have easily been overlooked and not inventoried. Therefore, the Liberty knife currently on display at Ford’s as Booth’s knife is not the assassin’s blade but likely an ornate knife recovered from Mrs. Surratt’s. It never belonged to the assassin, and, conceivably, it was never used to harm anyone. What then, became of the assassin’s blade? According to the 1940 transfer list, four knives were turned over to Ford’s and yet only three are on display. Two of those are correctly identified, while the Liberty knife continues its impersonation of Booth’s knife. The current fate of Booth’s true knife is identical to what it was for over 75 years. Booth’s knife is in storage. Stored as a generic “knife” with the rest of Ford’s overflow items, it is currently held in the National Parks Service Museum Resource Center in Landover, MD. There it sits, FOTH 3218, encased in protective foam, accompanied by its sheath. While the knife has been found, there is still a mystery to be solved. Booth’s knife has not always been hidden away in storage. There was a time when it was displayed by Ford’s accurately as Booth’s knife. Books from the 1950s and 60s have pictures of the real, Rio Grand Camp knife, with a spot of rust on the blade, endorsed by the NPS as Booth’s. But suddenly, and inexplicably, it was replaced with the Liberty knife. With the worsening budget cuts the NPS has suffered over the years, the paperwork on the knives at Ford’s is disorganized and, most importantly, they lack a historian to sort it all out. No one seems to know why the knives were switched, but they all trust the unknown predecessor who did so. If the switch was made due to a mere clerical error, the knife doesn’t deserve to sit in storage for another 75 years. It is this author’s hope that this article will merit a re-examination of the knives and the evidence regarding their identification. 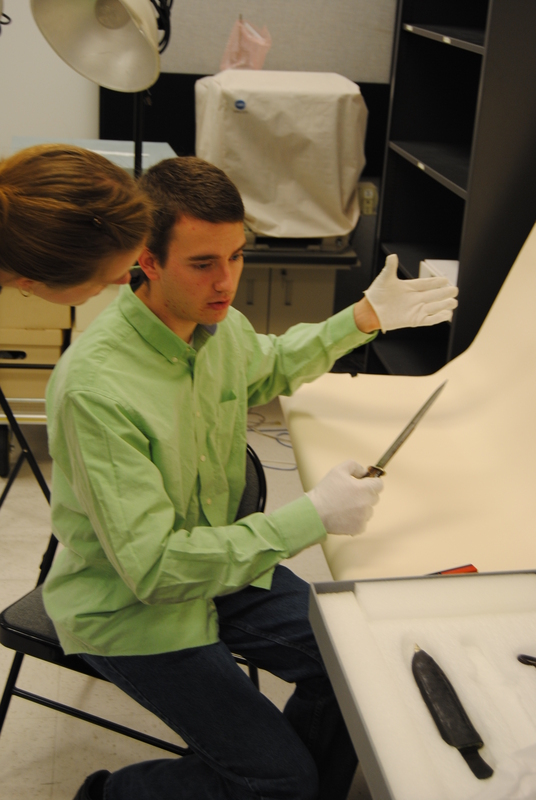 Hopefully, Booth’s true knife will escape from storage once again and be restored to the Ford’s Theatre Museum. Dave Taylor examining Booth’s true knife in 2012. Edwards, W.C., & Steers, E. (2010). The Lincoln assassination, the evidence. (pp. xxii – xxiii). Illinois: University of Illinois Press. Poore, B. P. (Ed. ), (1865). The conspiracy trial for the murder of the president, and the attempt to overthrow the government by the assassination of its principal officers. Vol. 1. (pp. 66) Boston, MA: J. E. Tilton and Company. Steers, E. (1997). His name is still Mudd: The case against Dr. Samuel Alexander Mudd. (p. 122). Gettysburg, PA: Thomas Publications. Edwards & Steers. (p. 758). U.S. House of Representatives. (1880). Journal of the House of Representatives of the United States, being the second session of the forty-sixth congress, begun held at the city of Washington, December 1, 1879, in the one hundred and fourth year of the independence of the United States. (p. 297) Washington City, DC: Government Printing Office. (1880, January 31). Assassination relics: A description of some of the articles Congress will order sent to Springfield. The Cleveland Leader, p. 3. Power, J. C. (1884). Annual reports of the custodian to the executive committee of the national Lincoln monument association, reports for nine years, from 1875 to 1883 inclusive. (p. 35) Springfield, IL: H. W. Rokker. (1899, May 24). The Booth relics, they are to be transferred to the national museum. The Minneapolis Journal. (1904, December 18). The first photographs of the mementos of Lincoln’s assassin. The Washington Times, p. 5. Copy of a list from the Judge Advocate Generals’ office dated February 5, 1940 in the files of James O. Hall. From the James O. Hall Research Center, Clinton, MD. (1867) Trial of John H. Surratt in criminal court for the District of Columbia. Vol. 1. (p. 308) Washington City, DC: Government Printing Office. Edwards & Steers. (p. 698). 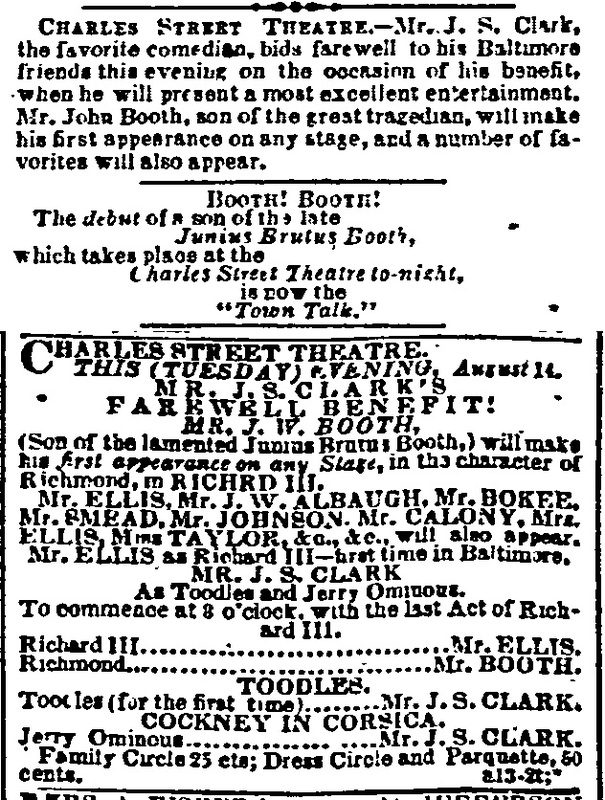 On June 15, 1863, John Wilkes Booth began an acting engagement in St. Louis, Missouri. While Booth visited many different cities as a touring star, the audiences of St. Louis were very supportive of his efforts. This particular engagement was his fourth time playing in the city in only a year and a half. In addition to the audiences, Booth was also aided by the fact that he had a pretty decent connection in the St. Louis theater scene. During each of Booth’s engagements in the city, he performed at Ben DeBar’s St. Louis Theatre. Ben DeBar was essentially family to Booth. In 1840, Booth’s eldest brother, Junius Brutus Booth, Jr. married Ben DeBar’s sister, Clementina. June and Clementina’s union did not last however because, in 1851, June took a page out of his father’s book and ran off with another woman. Despite this unpleasantness, Ben DeBar maintained a good relationship with John Wilkes Booth and the rest of the Booth family. Ben DeBar hired John Wilkes Booth for five different engagements in St. Louis, and when he opened another theater in New Orleans, Louisiana, John Wilkes was hired there as well. The June 1863 engagement in St. Louis was like any other for the 25 year-old actor. The newspapers noted that Booth was, “nightly greeted by full and fashionable houses; his performance[s] eliciting the most enthusiastic applause.” Booth’s engagement was scheduled to last from the 15th to the 27th, a normal two week engagement. After a few days in St. Louis, Booth was presented with an offer from an unusual source. 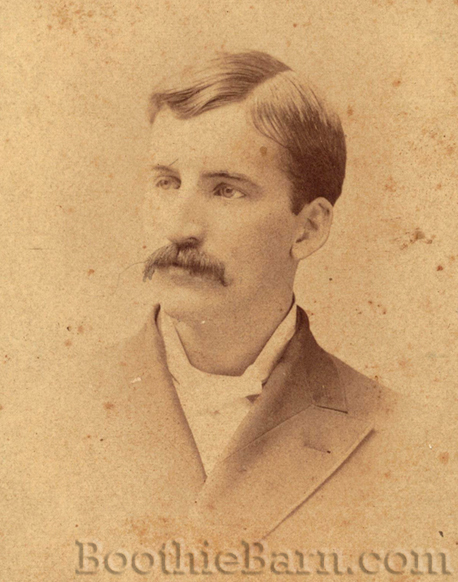 A Missouri resident by the name of R. J. Morgan approached Booth asking him if he could take Booth’s place on the final night of his engagement. It was not unheard of for actors to make such requests of their peers though it was more common for actors to request the services of their peers for benefit performances or during emergencies. Being asked to surrender a performance was less common. This request was even more strange, however, because the solicitor was not even a fellow actor, at least not yet. We know very little about the life of R. J. Morgan. His foray into theater begins and ends over the course of about a year. 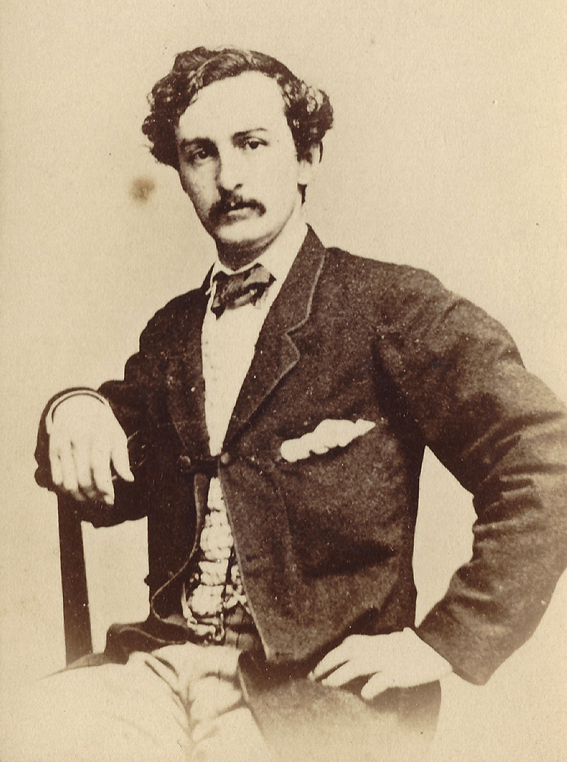 Four months prior to his proposition to John Wilkes Booth, R. J. Morgan was a relatively unknown man. He was born in England and at the beginning of the Civil War he resided in Missouri. In early 1863, he was briefly living in Davenport, Iowa. What his business was and why he was in Iowa is a mystery. Apparently, he was able to make somewhat of a name for himself as one who knew a little bit about European and American poetry. On February 17th, a group of citizens in Davenport wrote a letter to Morgan which was published in the newspaper. The men appealed to Morgan to honor them with a public reading of various poems known to him. One would expect that Morgan must have previously given private readings of poetry which motivated his friends and neighbors to ask for a public showing. Morgan accepted the invitation of the men stating, “I shall avail myself of the flattering invitation extended to me…” and “the entertainment proposed to be given, I trust you will look upon as an amateur affair, with little professional pretensions.” Morgan secured the use of Davenport’s Metropolitan Hall free of charge after insisting that the proceeds of the readings would not go to him, but would instead be donated to the needy families of absent Union soldiers. It might be a bit cynical but, given his later actions with Booth, it is not out of the realm of possibility that R. J. Morgan desired to start a career as an dramatic orator and organized the invitation and philanthropic gesture to work in his advantage. 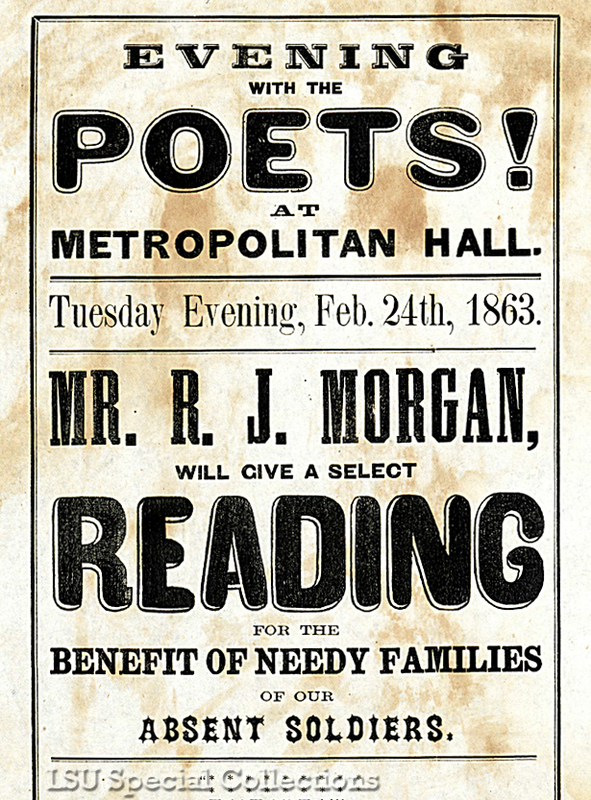 On the night of February 24, 1863, R. J. Morgan presented his “Evening with the Poets”. He presented readings of 12 poems including Beautiful Snow, a piece also rendered by John Wilkes Booth from time to time. While the audience enjoyed Morgan’s readings, the turnout was a bit lackluster for his first time out. 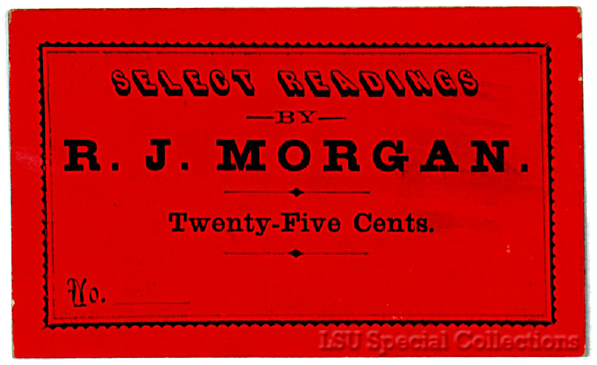 “The audience was not large,” the newspaper said, “but those who had the pleasure of listening to the reading of the selections on that occasion may count themselves fortunate…It is certain that the public greatly underestimated Mr. Morgan’s ability, else the Hall would have been filled…” Morgan stayed true to his word, however, and donated the night’s entire proceeds of $18 to the Adjutant General of Iowa. “Your request, that I will apply the amount to the relief of needy families of our absent soldiers shall be faithfully complied with,” the General wrote to Morgan (who subsequently had the note published in the newspaper). This initial, charitable reading, kick-started Morgan’s new career as a dramatic reader. Four days after his debut, Morgan gave another evening of readings in Rock Island, Illinois, just across the Mississippi River from Davenport. For his second reading he duplicated his first program entirely, but this time he took home the proceeds. After that, Morgan spent the next two months travelling around the Midwest giving readings in different cities. We have records of him performing in Iowa City, Muscatine, and Davenport, Iowa; Springfield and Jacksonville, Illinois; and in St. Louis, Missouri. He was apparently still in St. Louis when John Wilkes Booth came to town. As Morgan’s readings went on, he began expanding his repertoire. He incorporated more and more Shakespeare, doing readings from Hamlet, Othello, and Henry IV. Coincidentally, while he was on the road, Morgan’s talents as a reader drew comparisons with a family of actors, a member of which would be shortly known to him. After a performance in Muscatine, Iowa the newspapers wrote, “The rendering and acting of Hamlet in his deathless soliloquies, was of that high and brilliant order that few attain who reach for it. The true life, energy and expression was breathed into it so faithfully that even a Booth or a Forrest might listen profitably.” After four months, Morgan apparently believed he was ready to move beyond being merely a reader and elocutionist. He wanted to be an actor and so he approached John Wilkes Booth in order to make that happen. 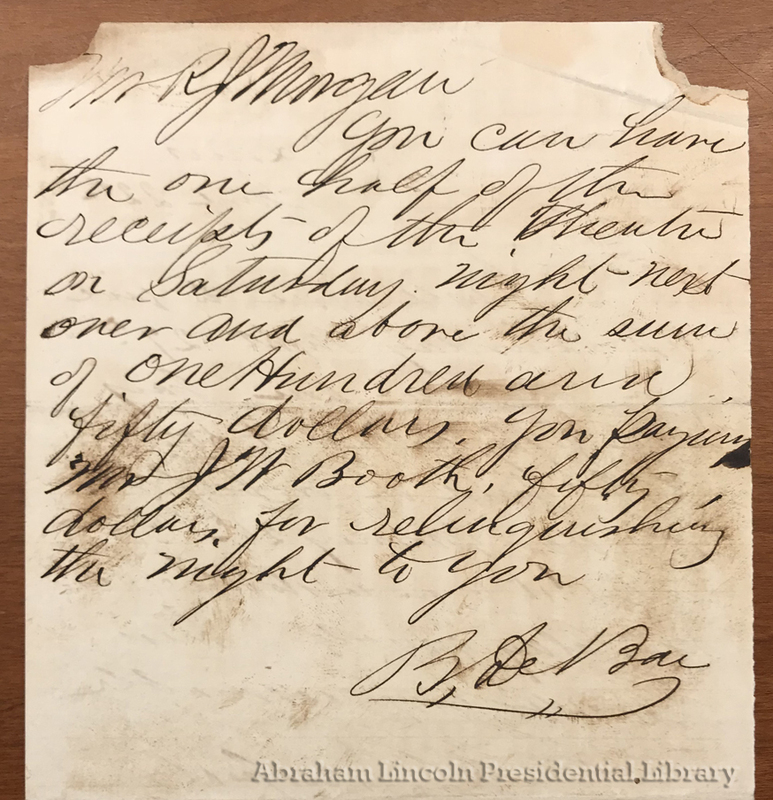 While Morgan’s correspondence to Booth doesn’t appear to survive, the two brief notes Booth wrote back to Morgan are housed in the Abraham Lincoln Presidential Library in Springfield as part of the Taper Collection. It’s clear that Morgan appealed to Booth to surrender the final day of his engagement so that Morgan could take his place and make his own theatrical debut. 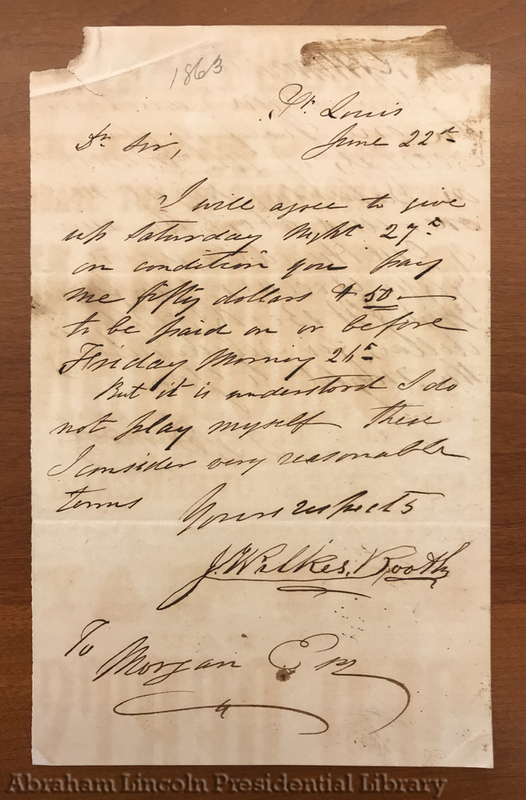 On June 22nd, Booth wrote to Morgan setting his terms for such a deal. John Wilkes Booth was perfectly willing to surrender the last night of his engagement – for a price. The 1862/1863 theatrical season had been a good one for Booth and he did very well financially in Chicago earlier in the season. In December of 1862 he wrote to a colleague that he had made $900 his first week in Chicago and, as such, had averaged about $650 per week so far that season. If his success had held out for the rest of the season, $50 was somewhat generous on Booth’s part since he was making around $100 per performance on average. With only two engagements left in the season Booth may have been fine with taking an extra day off, and making $50 not to go to work wasn’t a bad plan. With Booth’s note in hand, Morgan approached Ben DeBar seeking permission to perform at his theater. Since Booth had given his blessing, DeBar consented. Morgan wanted his debut to be a benefit performance for himself, where he would be entitled to a share of the box office. On the back of the same note Booth had written, DeBar gave his terms. You can have the one half of the receipts of the theatre on Saturday night next over and above the sum of one hundred and fifty dollars. You paying Mr. J W Booth fifty dollars for relinquishing the night to you. With these agreements in hand, R. J. Morgan began preparations for his debut. He chose A New Way to Pay Old Debts as his play, where he would perform the role of Sir Giles Overreach, the main character and villain. Coincidentally, Sir Giles Overreach was a favorite character of John Wilkes Booth’s father, Junius Brutus Booth, Sr. The elder Booth had performed the role over 320 times during his career. On Friday, June 26th, Morgan paid John Wilkes Booth the $50 he was owed. Booth then jotted down a note for Morgan, which acted as a receipt. The following evening, Saturday, June 27th, with tickets and playbills in hand, R. J. Morgan made his on stage debut as an actor. 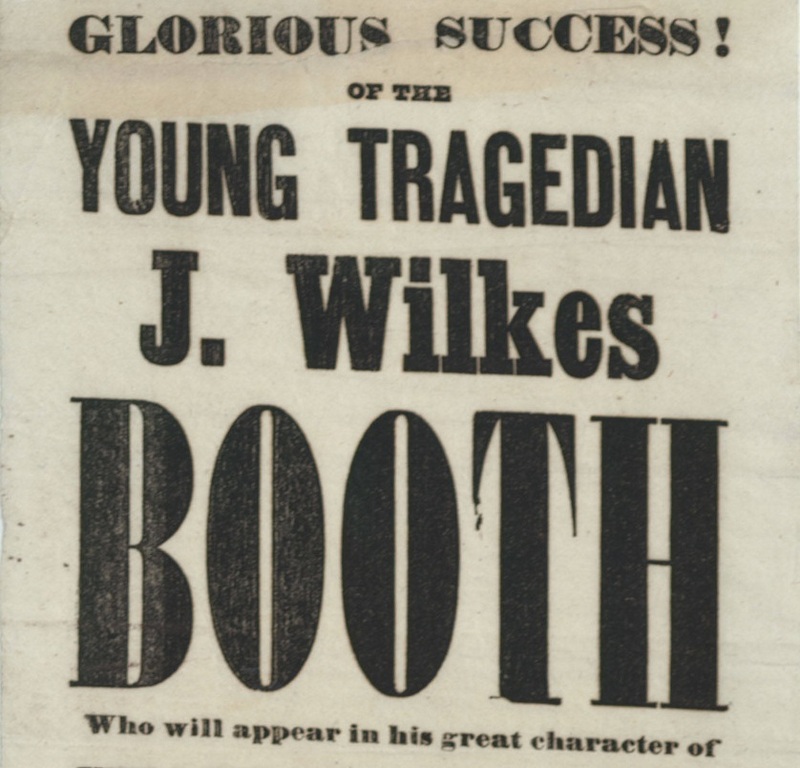 Whether John Wilkes Booth attended the performance of the man who took his place is unknown. By Monday Booth was already on route to Cleveland, Ohio for his next engagement. Brilliant or failure, Morgan’s on stage debut worked in his favor. 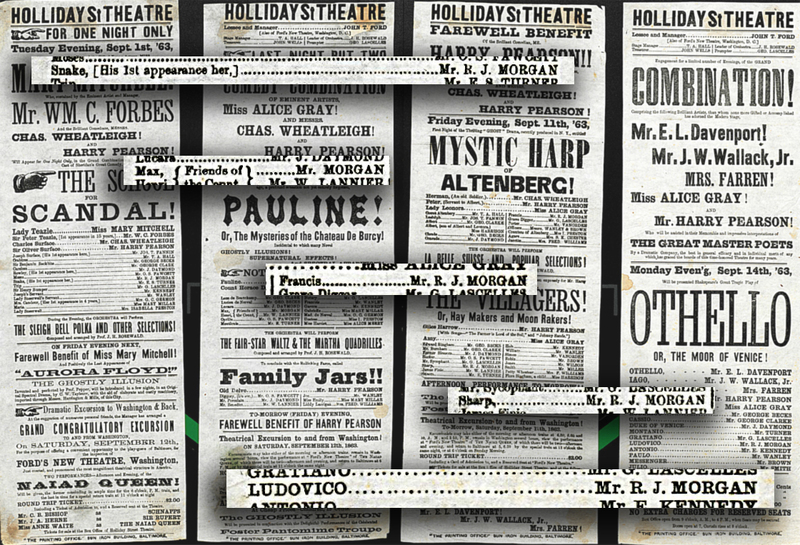 Though the 1862/63 theatrical season was wrapping up when he took the stage, the 1863/1864 season was just a couple months away. Somehow, perhaps through a good word from Ben DeBar or possibly even John Wilkes Booth, R. J. Morgan was hired by John T. Ford to become a member of the stock company at his Holliday Street Theatre in Baltimore. Morgan left the Midwest behind to follow his dreams on the east coast. The Holliday Street Theatre opened for the season on August 17th but Morgan didn’t grace the stage until September 1st. Despite being a stock actor, Morgan still found his name on the Holliday Street playbills from time to time. John T. Ford had a practice of publicizing his stock company and some took starring roles when the theater was in between star engagements. But, while Morgan’s name could be found on several playbills during his time with Ford, he always played second fiddle to the star actors or veteran members of the company. Morgan acted in both Shakespearean tragedies and comedic farces. On November 28th the Holliday Street Theatre put on the comedy Our American Cousin which would gain infamy a year and a half later. Morgan played the more serious role of Sir Edward Trenchard. For some reason or other, after December of 1863, R. J. Morgan left the Holliday Street Theatre. What caused Morgan to abandon his career as an actor is unknown. Perhaps he was unhappy with working as a subordinate stock actor. Maybe the fairly poor salary in that job wasn’t enough. Or perhaps he just missed his home. Whatever the reasons, by April of 1864, he had made his way back to St. Louis. On April 23rd, during a celebration of Shakespeare’s birthday, R. J. Morgan returned to his roots and gave dramatic readings from Shakespearean plays. Five days later, on April 28, he gave an evening of dramatic readings as a benefit for the St. Louis Sanitary Fair. In October of 1864, he received a pass to leave and re-enter the military district of St. Louis. From that point on, the life and dramatic career of R. J. Morgan returns to the anonymity from which he came. Even basic biographical data, like what the R & J stand for, is still a mystery. 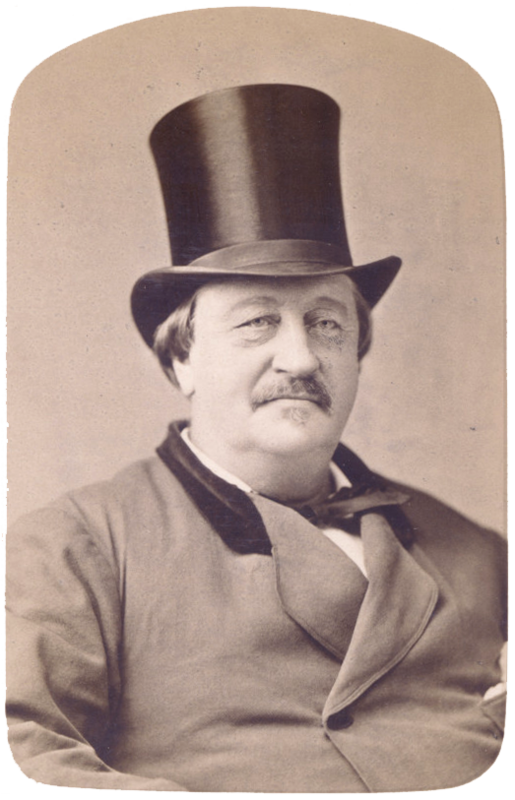 While there are possibilities as to his identity (there was an auctioneer named Rees J. Morgan who lived in St. Louis in 1865 and 1866), I have been unable to find definitive evidence of his life outside of 1863 – 1864. The bulk of what was presented here comes from some newspaper articles about his dramatic readings and a small collection of tickets and playbills from his career housed in the special collections department of Louisiana State University. How a collector in Louisiana acquired these few papers on R. J. Morgan’s life, I have no idea. 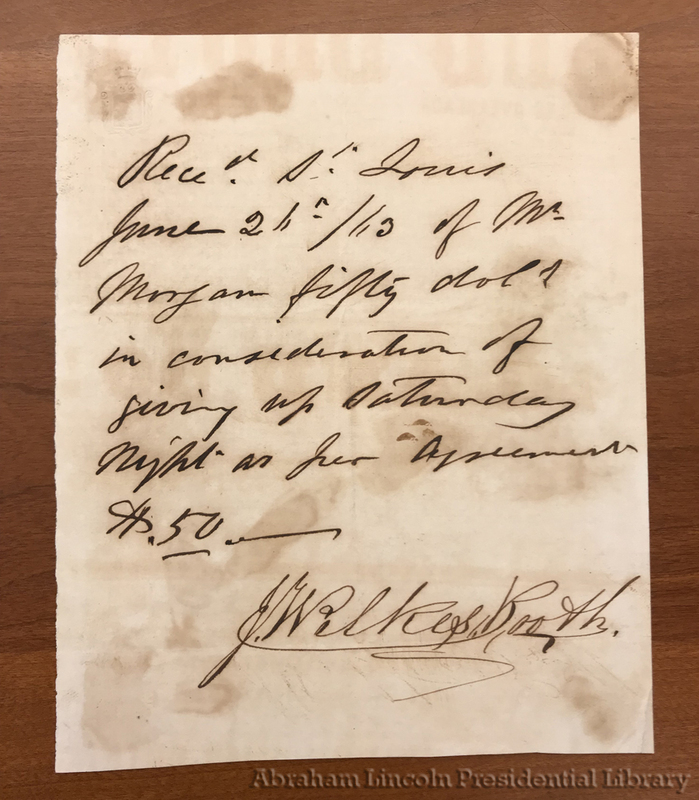 The few items about Morgan and John Wilkes Booth that are now a part of the ALPLM’s Taper collection were almost assuredly once a part of the same collection that was later donated to LSU. Hopefully more information about R. J. Morgan will be found in the future. In closing, while researching there were two interesting bits of trivia that I stumbled across. 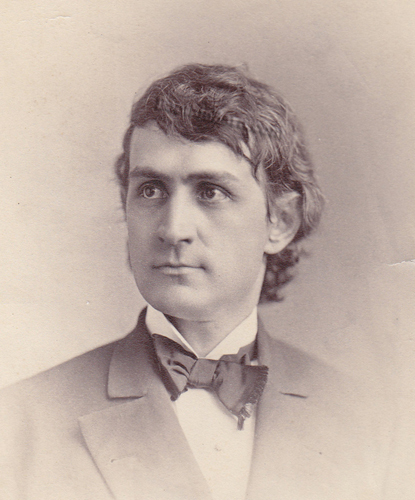 The first is that it is quite possible that R. J. Morgan, during his limited career with John T. Ford, may have actually performed at Ford’s Theatre. John Ford reopened his Washington theatre in August of 1863, after rebuilding it from a December 1862 fire. After its reopening, Ford would often pull from his Baltimore stock company when he needed extra performers in Washington. It’s very possible that R. J. Morgan was brought to Washington by Ford to supplement his new theater. R. J. Morgan was definitely in Washington, D.C. in January of 1864 because he received a military pass to visit Alexandria, Virginia during that time. What’s even more interesting to think about is the fact that John Wilkes Booth had an engagement at Ford’s Theatre in November of 1863, when Morgan was still employed by John T. Ford. Did Morgan have a chance to act beside the man who allowed him to get his start? Maybe. Lastly, while R. J. Morgan’s connection to John Wilkes Booth, the first presidential assassin, and Ben BeBar, a member of the Booth family, has been established, amazingly Morgan also has a slight connection to the second presidential assassin. 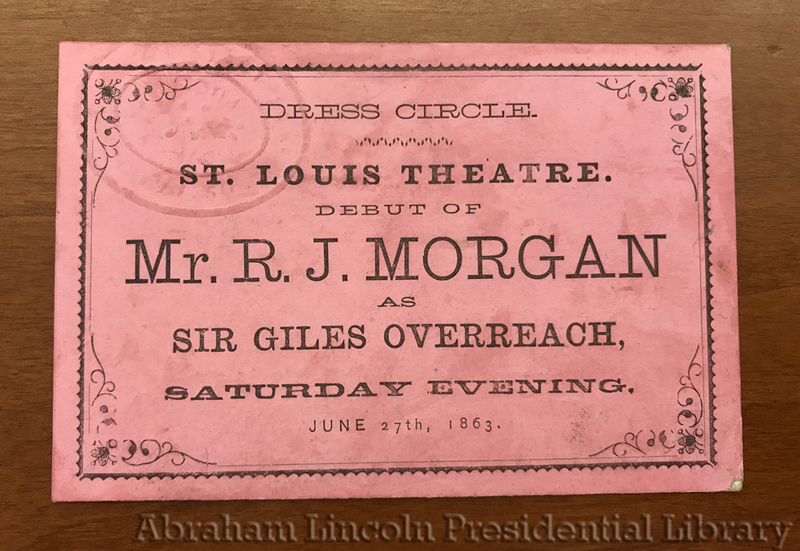 Remember that the event that put Morgan on the path to being an actor was that very first dramatic reading he was asked to do in Davenport in February of 1863. 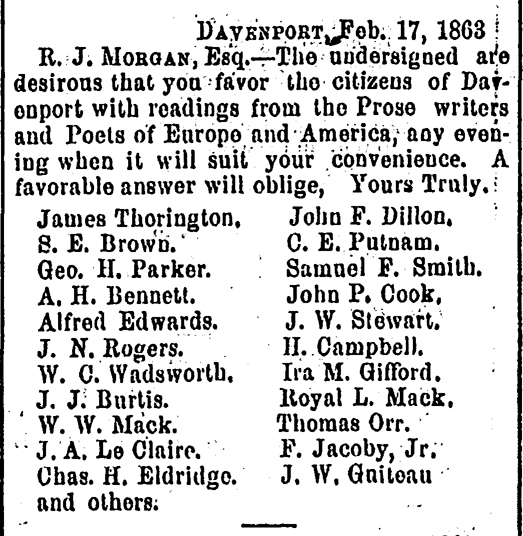 A group of the Davenport citizenry wrote to Morgan, with each man signing their name to the letter. A total of 22 men affixed their names to the request, the last of which was a man named “J. W. Guiteau”. This man’s full name was John Wilson Guiteau. He was a Davenport lawyer and the older brother of Charles J. Guiteau, the future assassin of President James Garfield. It’s so strange that R. J. Morgan made both his dramatic reading and acting debuts because of the support of assassins and their families. On select Thursdays we are highlighting the final resting place of someone related to the Lincoln assassination story. It may be the grave of someone whose name looms large in assassination literature, like a conspirator, or the grave of one of the many minor characters who crossed paths with history. Welcome to Grave Thursday. NOTE: I know today isn’t Thursday. I’ve been swamped with getting ready for the new school year to begin and though I tried to get this out yesterday, I found I had to do a bit more research. Rather than wait another week to post it, I figured I’d just post it tonight instead. So enjoy this Friday edition of Grave Thursday. Burial Location: Glenwood Cemetery, Washington, D.C.
Mary Van Tyne, whose maiden name was Ricard, was originally born in England. We know she had moved to the United States by 1833 for it was during that year that she married Dr. John P. Van Tyne in Maryland. By 1840, the pair had relocated to Washington City and quickly began building their family. By 1850, Mary and John were the parents of at least 5 children. In February of 1851, John Van Tyne died at the age of 44, leaving Mary a widow. She supported her family financially by working as a seamstress and dressmaker. As time went on, Mrs. Van Tyne even advertised her talents as a seamstress. In 1857, Mary’s only remaining son, Charles, died at the age of 21. In the 1860 census, Mary Van Tyne is shown as a widow, working as a dressmaker with her four daughters: Mary, Kate, Florida, and Ellen. During the Civil War, the population of D.C. boomed. Many homeowners made supplemental incomes by renting out rooms. Conspirator Mary Surratt would follow this route after relocating from her Maryland tavern to her D.C. town home. Mrs. Van Tyne, likewise started to rent out rooms and advertised her spaces in the D.C. papers. In February of 1865, two men took up Mrs. Van Tyne’s offer of lodging and began renting one of her rooms. 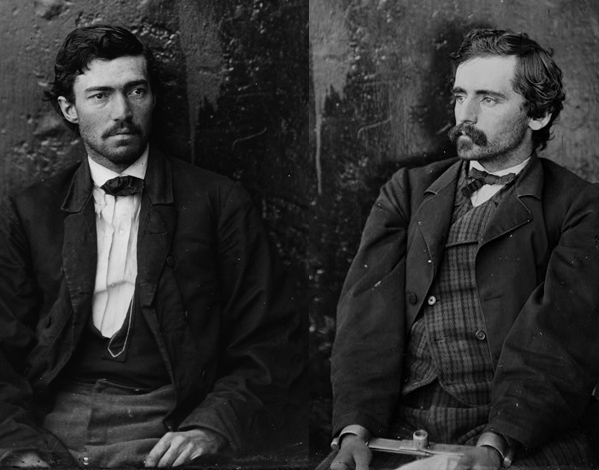 Their names were Samuel Arnold and Michael O’Laughlen and, unbeknownst to Mrs. Van Tyne, they were taking part in John Wilkes Booth’s plan to abduct President Lincoln. While Mrs. Van Tyne did not have a lot of contact with her new boarders, she did get to know a few things about them. For instance, Mr. O’Laughlen told her that he was also known as McLaughlin, and that if she should receive any mail addressed as such that it should come to him. Once, when cleaning their room, she came upon a pistol but didn’t think much of it and merely placed it in a bureau drawer for safe keeping. Often, the two men would leave and go to Baltimore on a Saturday and not return to the city until Monday or Tuesday. The two men were also frequently visited by a handsome man. The man would call at all times of day looking for the men and leaving messages for them. Finally, Mrs. Van Tyne inquired with her boarders about who the handsome man was. They informed her that he was John Wilkes Booth, the popular actor. Once, Mrs. Van Tyne overhead something among the men about business and she later asked Arnold what business they were in. Arnold replied that the three men were in the oil business together in Pennsylvania. Booth was a common visitor and often appeared to keep her boarders out late. Mr. Arnold and O’Laughlen had a night key which allowed them to come and go as they pleased. Since they were sleeping in a back bedroom on the first floor, she did not always know whether they were home or not. Finally, on March 18th, Arnold and O’Laughlen told Mrs. Van Tyne that they were going to be leaving for good on Monday the 20th. They were off to the Pennsylvania oil fields, they told her. They mentioned that while they were anxious to leave that very night, Booth was performing at Ford’s Theatre and they wanted to see him. Mrs. Van Tyne expressed her own desire to see Booth perform. Grateful for the lodging Mrs. Van Tyne had given them, O’Laughlen gave Mrs. Van Tyne three complimentary tickets for Booth’s performance in The Apostate at Ford’s Theatre that night. Mary Van Tyne neither heard from nor saw Mr. Arnold or Mr. O’Laughlen after they left on March 20th. After the assassination of Lincoln, the identities and movements of John Wilkes Booth’s conspirators were traced. On May 5th, Mrs. Van Tyne was interviewed by Baltimore provost marshal, James McPhail. McPhail and his men were largely responsible for hunting down Arnold and O’Laughlen. Mrs. Van Tyne told all that she knew about the two men who stayed in her home. Ten days later, Mrs. Van Tyne was among the first to be called to the witness stand at the trial of the conspirators. She testified about Booth’s common visitations to her home in search of Arnold and O’Laughlen. She was also asked to identify a picture of Booth as the man she saw. While she identified it, she also made the observation that the photograph presented to her was a poor likeness of the man and did not truly capture how handsome Booth was. After providing her testimony for the day, Mrs. Van Tyne returned home and back into obscurity. Mary Van Tyne continued to live in Washington, D.C.. By 1870, she moved out of her D street boardinghouse and began living with her daughter, Florida, who had married a man named Friebus. She would live with her daughter and son-in-law for the rest of her life. On December 18, 1886, Mary Van Tyne died of “valvular disease of [the] heart”. Her age at death is difficult to determine. Her obituary stated that she was “in her eighty-first year.” Her burial records give her an age of “80 years” and “5 months” at time of death. The census records did not really help the matter. 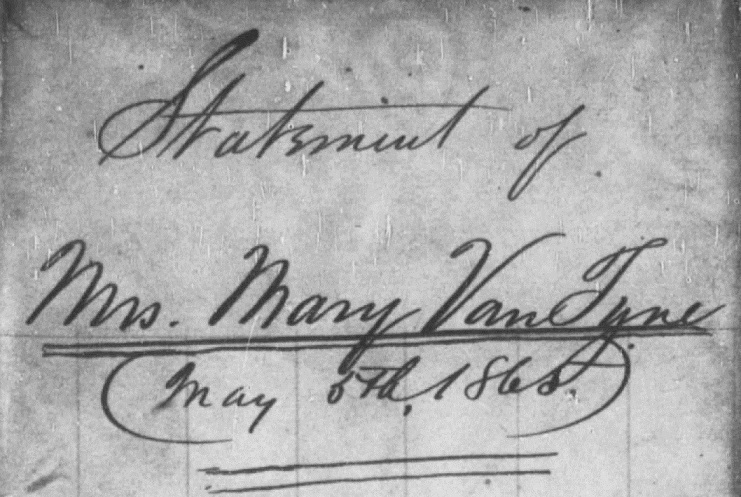 Unlike many census records where women miraculously age less than a decade in the ten years span between censuses, Mrs. Van Tyne actually managed to age more than ten years between the 1860 and 1870 census. The 1850 and 1860 census records give her birth at about 1812 which would make her about 74 at her death. The 1870 and 1880 censuses give her birth at about 1806 which puts her back up at 80. Upon her death, Mrs. Van Tyne was interred in Section P, Lot 202, Site 5 in D.C.’s Glenwood Cemetery. If Mrs. Van Tyne was marked with a gravestone upon her death, it no longer stands. 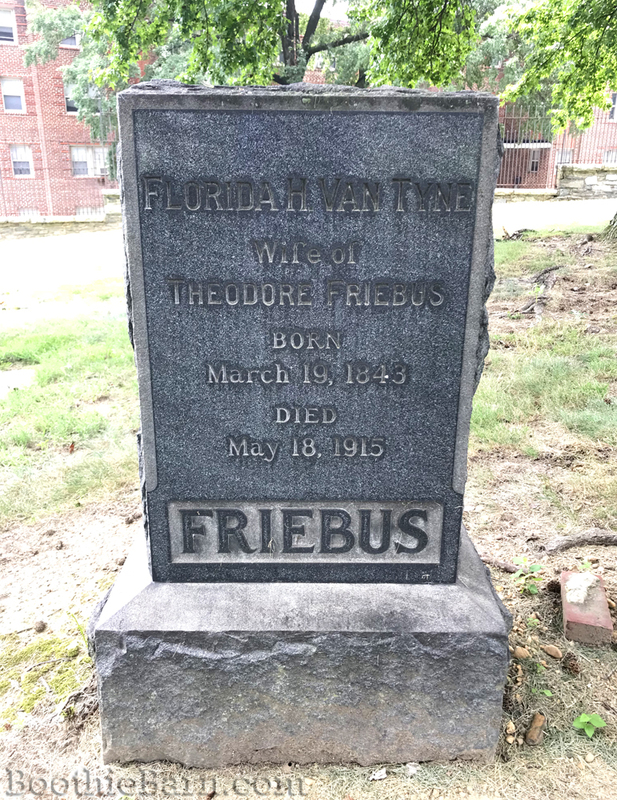 Her burial lot is only marked by the gravestone of her daughter, Florida Friebus nee Van Tyne, who died in 1915. 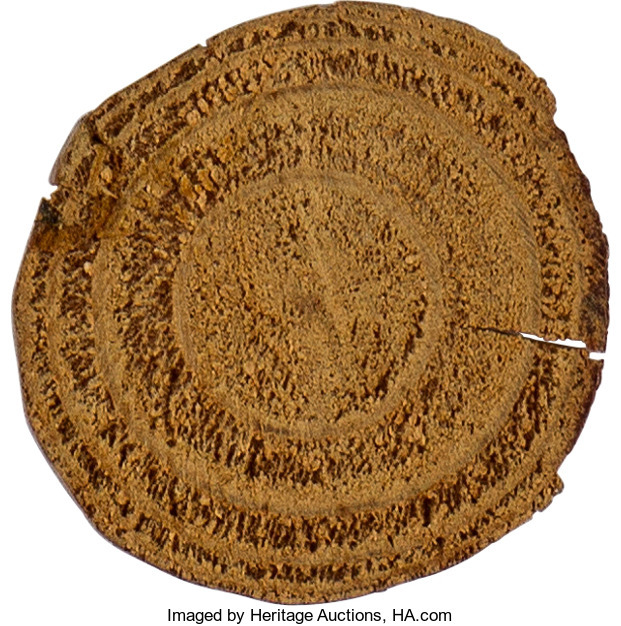 Later this month, Heritage Auctions will be auctioning off a unique relic: a cross section piece from the crutch of John Wilkes Booth. This piece of crutch is one among several lots in this auction that come from the family of noted Civil War photographer, Alexander Gardner. Gardner was responsible for photographing mugshots of the arrested conspirators and, later, documenting the execution of four of them. 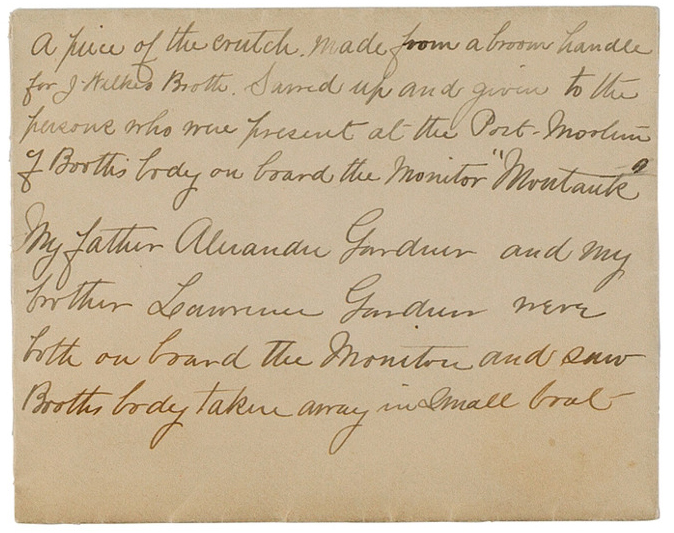 Accompanying this crutch piece is a handwritten note, likely written by Gardner’s daughter, Eliza, which states the history of the crutch piece. We know that Alexander Gardner and “an assistant” were brought on board the USS Montauk after John Wilkes Booth’s body had been brought back up to Washington. The long held story was that Gardner, assisted by another photographer named Timothy O’Sullivan, photographed the autopsy of John Wilkes Booth. According to the story, a single print of the autopsy photo was made, given to Secretary of War Edwin Stanton, and then lost to history. The allure of discovering this long missing Booth autopsy photograph (akin to the discovery of only known image of a visible Lincoln lying in his coffin) has been a goal of many researchers over the years. However, in 2013, impeccable research from John Elliott and Barry Cauchon for their “Inside the Walls” project on the imprisonment of the Lincoln conspirators helped explain why all efforts up to that point to locate the Booth autopsy photo had failed: it likely never existed. While all the evidence is nicely laid out in the duo’s third “A Peek Inside the Walls” supplement titled, “The Mystery of John Wilkes Booth’s Autopsy Photo“, the big discovery by John was an article that was published in 1891 from Lawrence Gardner. In the article, Lawrence Gardner decries the erroneous claims that John Wilkes Booth had not been killed. 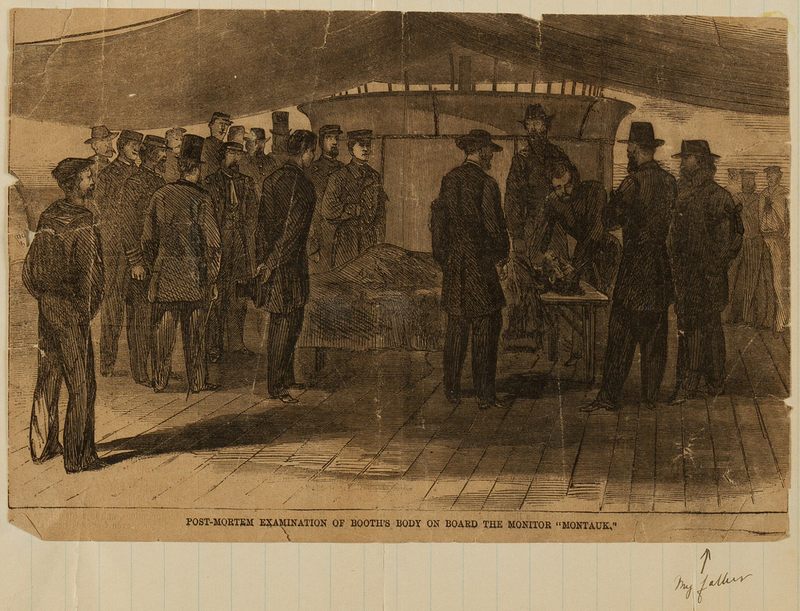 He then related his attendance as his father’s assistant on board the Montauk after Booth’s body had been placed upon it. Lawrence Gardner relates the same facts as practically everyone who viewed the deceased John Wilkes Booth’s remains – that his body underwent so much trauma and decay during his escape, death, and transport to Washington, that it looked very much unlike the living actor. This idea is often seized upon by conspiracy theorists as evidence of a patsy doppelganger who was killed in Booth’s place but Gardner, like the others who mentioned the poor condition of Booth’s body, is adamant that the body was properly identified. Asked by the reporter is it was actually Booth’s body, Gardner responded, “Of course it was. There could be no question about it,” and then proceeded to recount the different ways the remains were identified. With the decision being made not to photograph the decaying corpse of Booth, Lawrence and his father made three images of conspirator David Herold, who had been captured alongside Booth, before departing. Included in the lot with the piece of Booth’s crutch is a Harper’s Weekly drawing of the autopsy scene. Affixed onto a page, a notation, likely from Eliza Gardner, identifies her father, Alexander Gardner, among the men present. It is joined by a short affidavit that (in my mind) gives further credence to Lawrence Gardner’s claims in his newspaper article. “This is a copy of a pen & ink sketch made by my father Alexander Gardner and sent to Harper’s Weekly. Admittedly, Eliza Gardner’s phrasing that the government would not allow an autopsy photo, “to get out” is a bit ambiguous and open to interpretation. My own interpretation, however, reads this as a validation of Lawrence Gardner’s claim that no photograph was allowed to be taken at all. Instead, Alexander Gardner sketched the scene and inserted himself into it. This would also explain why the label for the drawing in Harper’s Weekly lacks the “from a photograph” tag that accompanies all the other engravings made from corresponding photographs. I believe this auction lot supports the case against an autopsy photo being taken, and feel that there is more evidence on that side. And, yet, I can’t help but look at the Booth autopsy photograph like Santa Claus. Logically and factually I can admit that it most likely doesn’t exist, but that isn’t going to stop me from hoping that it might turn up someday. Now John Best and Dr. Mudd may have been talented carpenters, but it would seem impossible that the two men could have transformed a rectangular plank of wood into two round crutches with circular grain patterns. The Gardner piece of crutch up for auction shows a tree’s circular growth rings and was clearly made from a tree branch or sapling. This is inconsistent with having been made from a wood plank. Faced with this contradiction, one could easily make the assumption that the crutch piece up for auction was a fake, thus casting doubt on everything for sale from the Gardner family including this signed pass to the trial of the conspirators and a lock of Lincoln’s hair. However, there is a very reasonable explanation as to why this piece of crutch does not match Dr. Mudd’s description: John Wilkes Booth had two pairs of crutches. John Wilkes Booth’s first pair of crutches, and the ones that everyone thinks of, are the crude ones made for him at Dr. Mudd’s farm. While some sources place their creation solely on the part of John Best, the Mudds’ English handyman, Dr. Mudd, as demonstrated above, claimed he assisted in making them. These initial crutches were rough to say the least, and yet Booth managed with them during most of his escape. He and Herold managed to carry them on horseback from the Mudd farm to Rich Hill and thence to the Pine Thicket. When Thomas Jones put the two fugitives across the Potomac, the crutches came with them in their rowboat. In Virginia, Booth had the crutches when he evicted William Lucas from his cabin after being rebuffed by Dr. Stuart. And Booth still had these crutches when he first appeared at the Garrett farm on the afternoon of April 24, 1865. 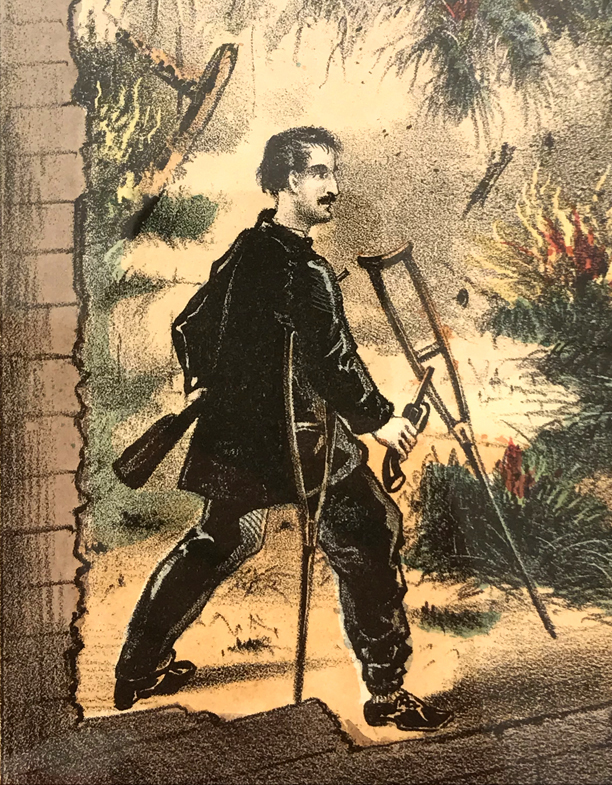 As noted by Richard Baynham Garrett, John Wilkes Booth did not get to use his new crutches for very long. About 36 hours after receiving them, Booth was shot in the Garretts’ burning tobacco barn and dragged to the porch of their farmhouse where he died. From the existence of the Gardner relic, it appears that when the soldiers went into the barn to drag out Booth and attempt to extinguish the flames, they also took the time to pull out some of Booth’s possessions. We know this to be likely as the carbine Booth was holding when he was shot was retrieved from the barn. According to witnesses, Booth had been using the crutches given to him by the Garretts right up to the point when he was about to come out the barn shooting. It seems possible that the soldiers of the 16th NY Cavalry retrieved at least one of the crutches from the barn and brought it back with them to Washington. The crutch (or crutches) was then sawed into pieces and given as souvenirs to those assembled at John Wilkes Booth’s identification and autopsy. This could explain why the piece offered for sale by Heritage Auctions doesn’t match Dr. Mudd’s description of how it was made. If genuine, the piece offered for sale must be from the nicer crutches given to Booth at the Garrett farm. Appropriately, it’s important to relate that this is not the only piece of John Wilkes Booth’s crutch that exists. At least one other crutch piece is still in private hands today. Maude Motley speaking with Booth buff John C. Brennan in Bowling Green, Virginia. A young Michael Kauffman (author of American Brutus) is on the right wearing plaid. Many who study the Lincoln assassination are familiar with the name of Ms. Maude Motley. 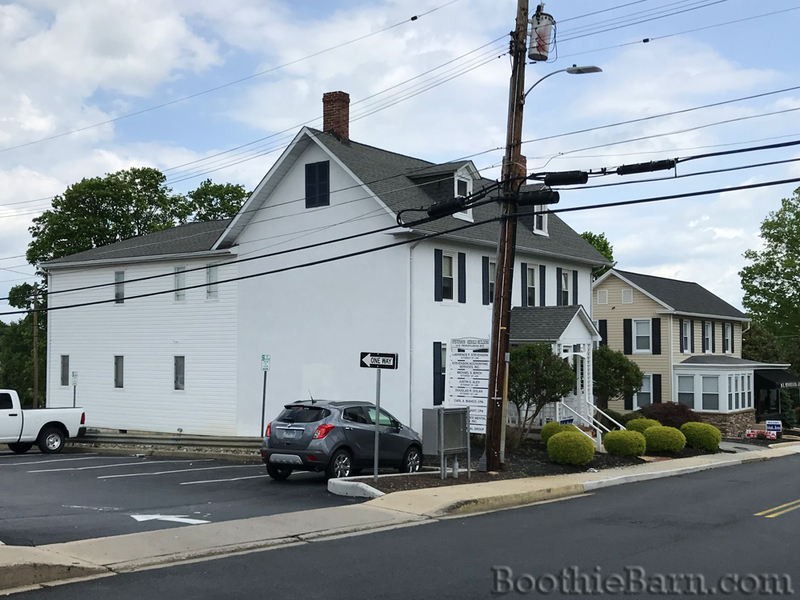 In the early days of the John Wilkes Booth escape route bus tour, rather than concluding at the Garrett farm and travelling no further south, the bus would go all the way down to Bowling Green, Virginia before heading back. While Booth never made it to Bowling Green, that is the location of where Willie Jett spent the nights of April 24th and 25th, before he was rudely awakened at gunpoint by the Union cavalry and forced to give up Booth’s location. David Herold spent the night of April 24th south of Bowling Green at a private home before rejoining Booth on the 25th. 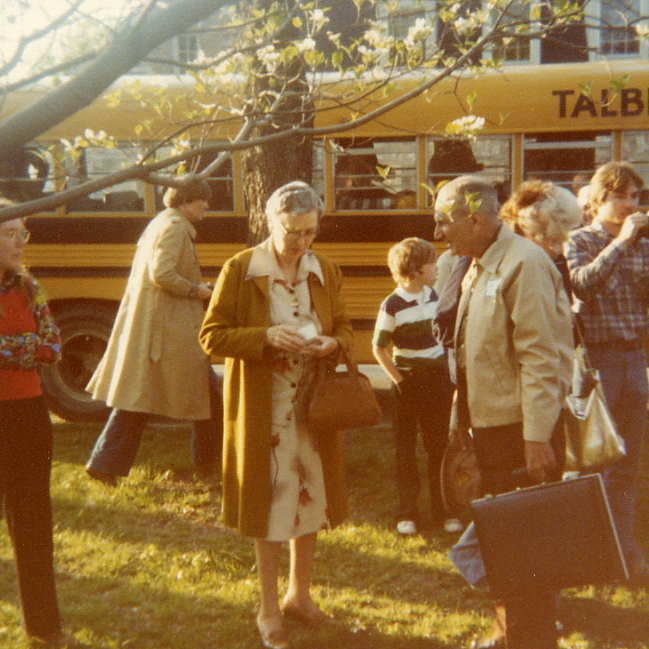 In the early days of the tour, Ms. Motley, a Caroline County native, would meet the bus tour at their stop in Bowling Green. In Bowling Green, Ms. Motley would tell the tour participants some of the local lore regarding the end of Booth’s life. For a time Ms. Motley’s mother boarded with Lucinda Holloway, Mrs. Garrett’s sister who was acting as a live in teacher when Booth was killed at her farm. Lucinda Holloway’s version of Booth’s death had been passed down to Ms. Motley through her mother and she enjoyed telling it. But more than anything else, however, Ms. Motley regularly met the bus in Bowling Green in order to show off her unique relic: a piece of John Wilkes Booth’s crutch. Ms. Motley’s story regarding how she got the piece of crutch is really best told in her own words. Luckily we have a recording of her speaking about the death of Booth and her crutch piece from a talk she gave in 1979. Below is an excerpt from that recording which covers how she acquired the crutch piece. As Ms. Motley related it, one of the charred crutches from the barn was chopped up and shared among the Garretts’ neighbors after the Union troops left on April 26th. One of the recipients of a piece of crutch was the father of Ms. Motley’s neighbor and it was that neighbor who gifted the piece to her. On one side of the crutch piece, which Ms. Motley had set with a metal tag, some charring can be seen, ostensibly from the fire that consumed the Garrett barn. Ms. Motley’s provenance is pretty good with only one slight problem with the timeline of her story. The elderly neighbor who gave the piece to Ms. Motley was Ms. Reeta Gray. Her father, the one who was said to have received the piece at the Garretts’, was William Edward Gray. William Gray was about the same age as Jack Garrett and was also a Confederate soldier. Unlike Jack, however, William Gray had been captured near the end of the war when the Union took Richmond. Gray was being held as a prisoner of war in Ashland, Virginia on the morning of Booth’s death. He could not have, in Ms. Motley’s words, “rushed over” to the Garrett farm on account of the barn being on fire. William Gray signed his oath of allegiance and was released from custody the next day April 27th and was allowed to return home to Caroline County. Now despite this small discrepancy, it is still very possible that William Gray acquired a piece of crutch some time after his return, passing it down to his daughter who gave it to Ms. Motley. Though impossible to prove or know for certain, I’d like to think that the two known pieces of crutch, Ms. Motley’s and the Gardner one, come from the two different sets of crutches Booth used. The Gardner piece looks like it came from a legitimate crutch as opposed to a piece of plank, which, assumedly, would make it part of the set given to Booth by the Garretts. Ms. Motley’s piece which looks a little more plank like (though the small size makes it impossible to truly tell) could have come from the set made by Dr. Mudd. “But wait,” you might be saying, “if Ms. Motley’s piece of crutch was from the set made by Dr. Mudd and then traded for a better pair, why would it show evidence of burning?” Well, the answer to that is simple: Booth’s original pair of crutches got burned (at least a little bit). But here’s the thing, like many other claims of priceless relics being destroyed, Richard Baynham Garrett didn’t go through with burning the entirety of Booth’s crutches. In fact, as a 25 year-old seminary student in 1880, Richard B. Garrett wrote a letter to then Judge Advocate General William McKee Dunn offering him some of the relics still in the family’s possession. In the letter he mentions still having a piece of Booth’s crutch. The Garretts were suffering financially at the time o this letter and Richard B. Garrett, needing money to continue seminary, was likely hoping the government would pay him for the relics. They declined and so the items stayed in the family. It seems a distinct possibility that, if Richard B. Garrett retained at least one piece of Booth’s original crutches, that he may have saved and gave away other original pieces. Perhaps, rather than neighbors chopping of pieces of the “burned in the barn crutch” on the day of Booth’s death as Ms. Motely claimed, the Garretts, instead, gave away some salvaged pieces of Booth’s original pair of crutches from young Richard Baynham Garrett’s attempt to destroy the evidence. We will never really know for sure. Call it another, Santa Claus if you like, but I’d like to think the two known crutch pieces came from the two different sets of crutches, making both extremely unique. Like Reeta Gray before her, Ms. Motley never married or had children of her own. When she died in 1989, Ms. Motley left her piece of crutch to her nephew. It may have changed hands a few times after that, but I don’t know that for sure. Today, the Motley piece of crutch is in private hands and is owned by a noted John Wilkes Booth authority. Proxy bidding (early online bidding) for the Gardner crutch piece from Hertiage Auctions is already open with the actual auction scheduled for August 25th and 26th. For those of you interested in getting me a nice “Back to School” gift, bidding on the Gardner crutch piece starts at a very reasonable $2,500 ($3,125 including the buyer’s premium). Garrett, R. (1907, December 29) The Escape and Suicide of John Wilkes Booth. Macon Telegraph Sunday, p 4. Burr, F. (1881, December 11) John Wilkes Booth, The Scene of the Assassin’s Death Visited. Interesting Memories of the Garrett Family. A Full Narrative of the Tragic Events. Boston Sunday Herald. The Bel Air Academy was one of the earliest institutions of learning that the future assassin of Lincoln, John Wilkes Booth, attended. 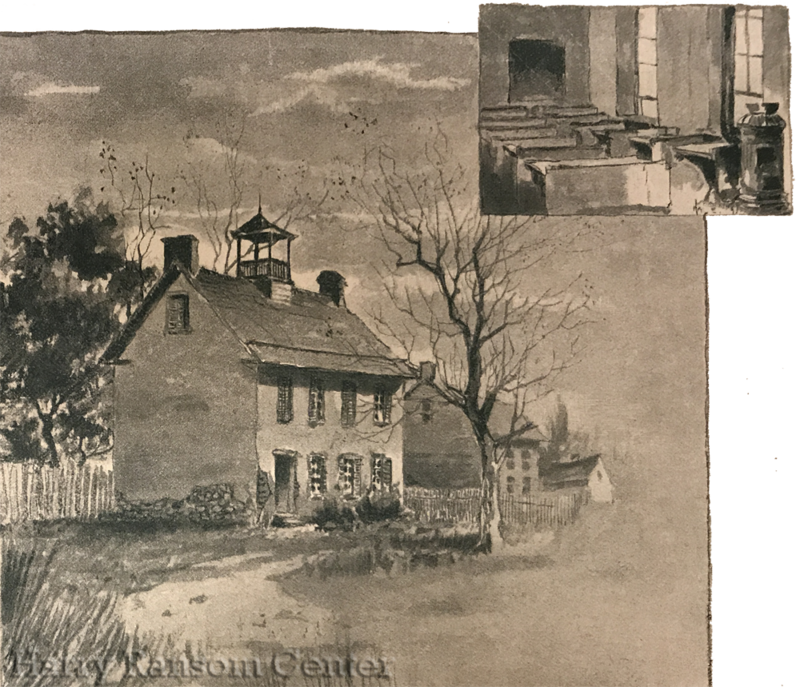 Founded in 1811, the Academy, which was also known as the Harford County Academy, was one of many private institutions that existed in the 1800’s well before centralized school districts were the norm. The Academy catered mainly to the education of the locals in Harford County, but also advertised itself as a suitable boarding school for out of town pupils. The exact date of John Wilkes Booth’s attendance of the Bel Air Academy is not known with exact certainty, but it appears to have started in about 1846, when Booth was eight years old. John Wilkes was joined at the school by his younger brother, Joseph, who was a little less than two years his junior. In 1848, the Bel Air Academy received a new principal who also served as teacher. 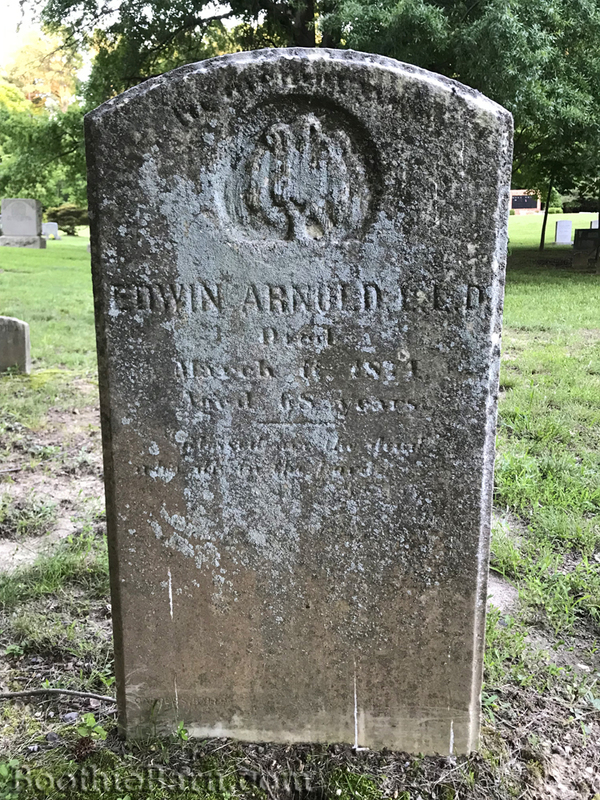 His name was Edwin Arnold. A native of Canada, Dr. Arnold was the son of Rev. Oliver Arnold, an Anglican pastor and Indian teacher in New Brunswick. Edwin Arnold was also ordained in the Anglican faith but resigned from the pastorate after eight years in order to devote his full time to teaching. Prior to becoming the principal of the Bel Air Academy, Dr. Arnold had served schools in New Brunswick; Freehold, New Jersey; Bordentown, New Jersey; Easton, Maryland; and Washington, D.C. When Dr. Arnold was chosen to lead the Bel Air Academy, he was highly spoken of by all his former schools. Edwin Arnold moved himself and his family next to the Bel Air Academy building. The principal’s son, Edwin, Jr. joined the school as one of his father’s pupils. Edwin Arnold provided the students at the Academy a classical education based on the English tradition. The days were spent reading, memorizing, reciting, and learning the lessons of classic works of literature. For an extra fee, students could also receive instruction in the French language taught by another teacher whom Dr. Arnold hired for the purpose. Dr. Arnold was also fond of arithmetic, writing and publishing his own book on its proper instruction called Arithmetical Questions, a new plan, intended to answer the double purpose of arithmetical instruction and miscellaneous information. With the help of his colleague, the book was also available in French. At the time of Dr. Arnold’s arrival at the school, and likely in the time preceding it, John Wilkes Booth was known as one of the school’s “day scholars”. This meant that, everyday, John Wilkes rode his horse from the family farm outside of Bel Air into town for school. Joseph Booth, on the other hand, lived with and lodged with Edwin Arnold and his family. Such accommodations cost more money, but Dr. Arnold highlighted the benefits of one-on-one after hours instruction and continual access to his library to student boarders. It appears that Mary Ann and Junius Booth decided that it was their youngest son, Joseph, who would make better use of such an arrangement as opposed to their less educationally inclined son, John Wilkes. One of the Booths’ fellow students at the Bel Air Academy was a boy by the name of George Y. Maynadier. In the years that followed, Maynadier became an important figure in Harford County. As a young lawyer he was elected state’s attorney for the county from 1862 to 1867. In 1871, he was made a Harford County judge. Maynadier did another stint as state’s attorney from 1879 to 1887 and in his later retirement from civic duty, though he was still a lawyer, Maynadier was one of the editors for the local Bel Air newspaper, the Southern Aegis. In his narrative, Maynadier recalled a booze filled party that he, the Booth brothers, and even the principal’s son, Edwin Arnold, Jr., took part in at the close of a spring session. This event likely occurred in the spring of 1849. For reference, at the assumed time that this rambunctious party of boys occurred John Wilkes Booth, George Maynadier, and Joseph Booth were 11, 10, and 9 years-old, respectively. While Dr. Arnold did not expel any of the party participants (the inclusion of his own 8 year-old son caused difficulty in that), the spring session of 1849 proved to be John Wilkes Booth’s last at the Bel Air Academy. In the fall of 1849, John Wilkes Booth was sent by his parents to the Milton Boarding School in Cockeysville, Maryland. It appears, however, that Joseph Booth stayed on at the Bel Air Academy with Dr. Arnold for a couple more years before the brothers were reunited in school together at St. Timothy’s Hall in Catonsville, Maryland in 1852. The Bel Air Academy building (with later additions) still stands today. Dr. Arnold continued as the head of the Bel Air Academy until either 1853 or 1854. In November of 1854, he became the principal of Elkton Academy, which was located about 30 miles east of Bel Air. Coincidentally, in the fall of 1854, Asia Booth wrote a note to her friend Jean Anderson stating that, “Joe goes to school in Elkton, Cecil County”. It appears that Joseph Booth was, for a time, returned to the tutelage of Dr. Arnold. While John Wilkes Booth had ended his formal education in 1853, he was still seen from time to time around Bel Air. Even after he started his stage career, Wilkes returned to his former hometown. He spent most of the summer of 1861 in isolation in Bel Air, renting a hotel room and memorizing plays. In his article, Maynadier recalled a run in with Booth during this time. It appears that Booth couldn’t help playing a trick on his old Bel Air Academy chums. Dr. Arnold, meanwhile, had departed the Elkton Academy in April of 1856 and traveled to the north Baltimore suburb of Mount Washington, where he had set up his own school, the Rugby Institute. 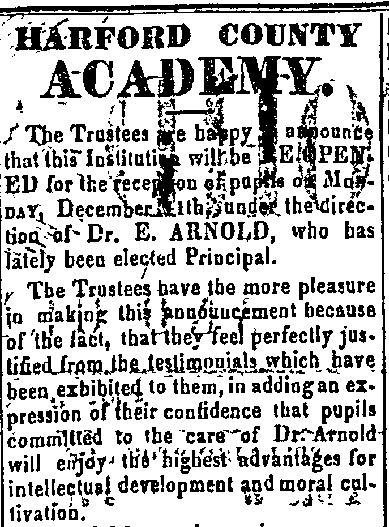 The start of the Civil War greatly reduced the number of enrolled pupils and Arnold was forced to close the Institute down in August of 1861. During the war, Dr. Arnold and his family took up residence in Calvert County in Southern Maryland where he became a farmer. At war’s end he resumed his career as a teacher, heading up the Salisbury Institute on Maryland’s eastern shore while his family stayed in Calvert County. Dr. Arnold’s daughter died in 1869, and the 64 year-old teacher ended his educational career that same year. The one time teacher of John Wilkes Booth died at his Calvert County home on March 11, 1874 and was buried next to his daughter. The name of the schoolmate whom Maynadier refused to provide the full name of was George B. Love. 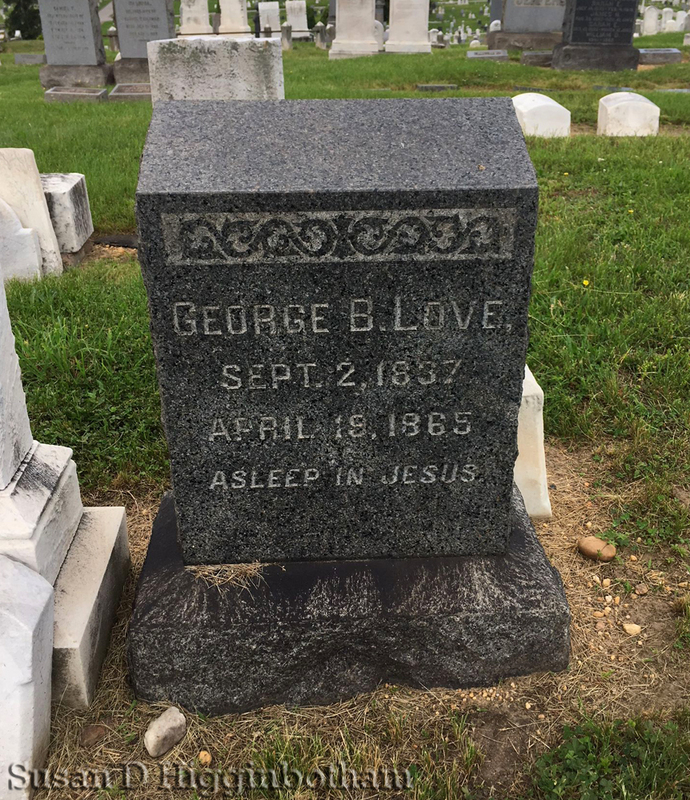 In addition, his recollection of the events regarding Love’s death are correct and George Love did commit suicide after being captured trying to cross the Union lines out of Washington after the assassination of Lincoln. George Love’s story is a fascinating one that I would love (no pun intended) to tell you. However, as I was working on this blog post I discovered that fellow researcher and author Susan Higginbotham had already beaten me to the punch. Unbeknownst to each other, we were both researching Love’s story at the same time. 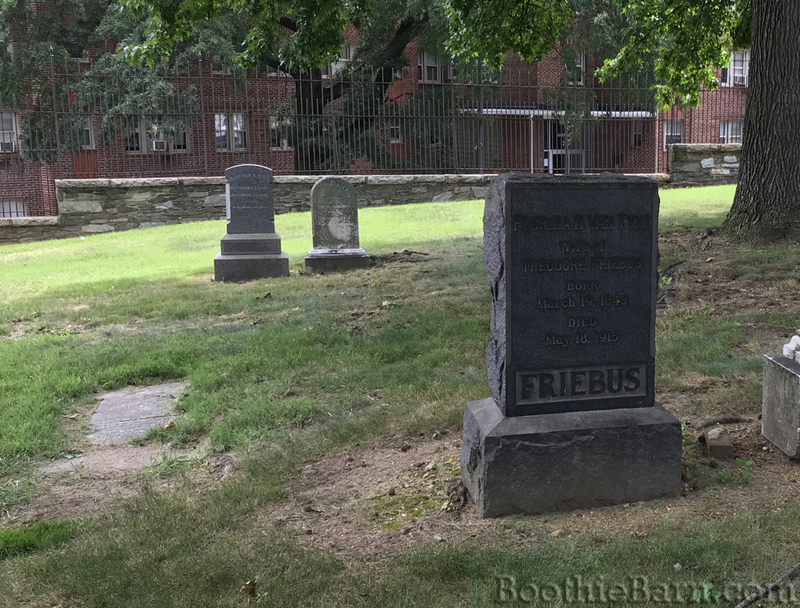 Susan had visited Love’s grave in Baltimore Cemetery and when I emailed her today asking for permission to use her photo of his grave in this blog post, she informed me of the similar path we had been taking. So, rather than telling you the story of George Love here, you’re all going to have to wait a month until Susan’s article titled, “The Strange, Sad Case of George B. Love” is published in the August 2018 edition of the Surratt Courier. Susan has done a marvelous job delving into Love’s life and mysterious death. If you’re not already a member of the Surratt Society, sign up today so that you won’t miss out on getting Susan’s excellent article. The old Bel Air Academy building, the place where George Maynadier, George Love, Joseph and John Wilkes Booth, and many others received their early education still stands in Bel Air. Now offices for a law firm and others, a small historic plaque above the door gives the name of what this building once was. For about three years, John Wilkes Booth plodded through classical literature and arithmetic here. Perhaps if he had spent less time at play and more time at his studies, these walls could have changed the course of history. (1902, March 7) Additional Reminiscences of the Booth Family. Southern Aegis, p 4. On March 20, 1869, Dr. Samuel A. Mudd walked in the front door of his Charles County, Maryland home. Such a return to one’s property would hardly be worth mentioning if not for the fact that it had been almost four years since the doctor had set foot on his farm. 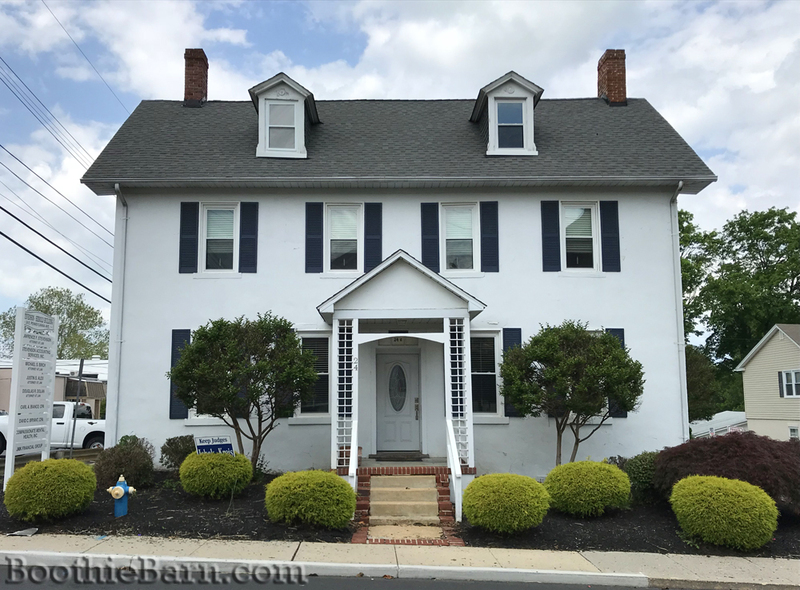 The last time Dr. Mudd was able to take in the land around him and the house which he called his home was on April 21, 1865, the day he was arrested for suspicion of complicity in Abraham Lincoln’s death. Since that time, Dr. Mudd had been imprisoned in nearby Bryantown, the Old Capitol Prison in D.C., and finally the Old Arsenal Penitentiary where he was put on trial by military commission. Found guilty, Dr. Mudd barely escaped with his life when he was sentenced to life imprisonment and sent to Fort Jefferson off of the coast of Florida. From July 24, 1865 through March 11, 1869, the desolate Dry Tortugas was the only home the prisoner, Dr. Mudd, had known. During his time on the island, he had tried (and failed) to escape, causing himself and the other Lincoln conspirators to suffer the consequences. In 1867, when a Yellow Fever epidemic swept the Fort causing his companion Michael O’Laughlen to die, Dr. Mudd volunteered his medical services and tended to the ill. With the common belief of the day being that those infected with Yellow Fever were contagious, Mudd’s assistance to the sick was seen as a selfless and noble act. His actions worked in his favor to help him secure a pardon in the final days of Andrew Johnson’s presidency. Nine days after leaving Fort Jefferson, Dr. Samuel Mudd stepped through the threshold of his home to greet his waiting children. Less than a week after his homecoming, Dr. Mudd heard an unexpected knock on his door. Though you might expect him to be incredibly wary of unannounced visitors, he opened the door and welcomed a small party of men inside. Among the group was a newspaper reporter from the New York Herald. The reporter and his party had come from Washington and had spent about eight hours making their way down to the isolated Mudd farm. They wanted to speak with Dr. Mudd about his experiences regarding John Wilkes Booth and the Dry Tortugas. Yet, despite his apprehension and claim he did not wish to speak about the events that cost the last four years of his life, in the end, Dr. Mudd and his wife did open up about their most famous visitors and their aftermath. The following is a transcription of part of the New York Herald article that was published on March 31, 1869, just a few days after speaking with Dr. Mudd. The entire article is quite long, with the first half dealing with the author’s slow trek to get to the Mudd farm from Washington. While filled with vivid and sometimes flowery details of the journey, for ease of reading only the parts relating to the interview with Dr. Mudd are featured below. If you are interested in reading the whole article, you can do so by clicking here or the headline below. The interview (like all the statements and correspondences from Dr. Mudd) contains a variety of truths, half-truths, omissions, and outright falsehoods regarding Booth’s relationship with Mudd and his time at the Mudd farm. Still, this interview provides an interesting and personal view of one of the more debated conspirators in the Lincoln assassination story. …We knocked for admission at the same door that Booth did after his six hours’ ride –it took us eight – and were promptly answered by a pale and serious looking gentleman, who, in answer to our inquiry if he were Dr. Mudd, replied, “That’s my name.” It was gratifying after so long a journey to find the man you sought directly on hand and apparently prepared to furnish you will the amplest stores of information regarding his connection with Booth, &c. Having stated the object of our visit – that the Herald led an interest in learning some particulars of his experience in the Dry Tortugas and his recollections of the assassination conspirators – his face grew extremely serious and he answered that of all things he wished to avoid it was newspaper publicity, simply because nothing was ever printed in connection with his name that did not misrepresent him. Having, however, convinced the doctor that it was with no motive to misrepresent his statements that we paid him this visit and tat between Booth’s case and ours there was no analogy, he invited us to pass the evening at his house and postpone our return to Washington till the morning. Left alone for a while in the parlor, an ample, square apartment, with folding doors separating it from the dining room, we began to feel an irresistible inclination to imagine two strangers on horseback riding up to the door in the dim gray of an April morning, the younger of the two lifting the other from his saddle and bother like evil stars crossing the threshold of an innocent and happy household to blast its peace forever, Dr. Mudd’s return disturbed our reveries. The Doctor says he is thirty-five years of age, married in 1860 [sic], built the house in which he now lives after his marriage, owned a well stocked farm of about thirty acres, and was in the enjoyment of a pretty extensive practice up to the time of his arrest in 1865. The word went well and smoothly with him previous to that unhappy event. His house was furnished with all the comfort of a country gentleman’s residence. He had his horses and hounds, and in the sporting season was foremost at every fox hunt and at every many outdoor sport. He had robust health and a vigorous, athletic frame in those days, but it is very different with him now. Above the middle height, with a reddish mustache and chin whisker, a high forehead and attenuated nose, his appearance indicates a man of calm and slow reflection, gentle in manner, and of a very domestic turn. He says he was born within a few miles of this house, and has lived all his life in the country. His whole desire now it to be allowed to spend the balance of his days quietly in the bosom of his family. In his sunken, lustreless eye, pallid lips and cold, ashy complexion one can read the words “Dry Tortugas” with a terrible significance. In the prime of his years, looking prematurely old and careworn, there are few indeed who could gaze on the wreck and ravage in the face of this man before them without feeling a sentiment of sympathy and commiseration. “I have come home,” said the Doctor sorrowfully, “to find nothing left me but my house and family. No money, no provisions, no crops in the ground and no clear way before me where to derive the means of support in my present [unintelligible] condition.” There was no deception here. In the scantly furniture of the house and in the pale, sad countenance of the speaker there was evidence enough of poor and altered fortune. It was not evening and growing rapidly dark. A big fire blazed on the ample hearth, and Mrs. Mudd, an intelligent and handsome lady, with one of her children, joined the Doctor and ourselves in the conversation over the events of that memorable April morning after the assassination. “Did you see Booth, Mrs. Mudd?” we inquired with a feeling of intense interest to hear her reply. “What kind of a fracture did Booth sustain?” we inquired, addressing the Doctor. “How did Booth’s horse look after his long ride?” we inquired. The Doctor talked at considerable length on many other topics connected with his imprisonment. In replying to the remark that his feelings must have been greatly exercised at coming within sight of his old home and meeting his wife once more he said, with visible tremor, that words were entirely inadequate to express the overwhelming emotions that filled his mind. It appears that a few days before he left the Dry Tortugas a company of the Third artillery, who were on board a transport about being shipped to some other point, on seeing the Doctor walking on the parapet, set up three cheers for the man who periled his life for them in the heroic fight with the dread visitation of fever. We talked along till midnight, then retired to a comfortable leather bed, and, rising with the sun in the morning, started out homeward journey to Washington. (1869, March 31) Dr. Mudd. New York Herald, p. 10. Prior to the assassination of Abraham Lincoln, John Wilkes Booth was known as one of the preeminent actors of his day. Having come from a theatrical dynasty that included his father and brothers, Booth found great success as a touring star. His engagements in different cities were always well attended and, even in his early attempts, his talent in his chosen roles was commented on in the press. The best works that delve into Booth’s theatrical career are John Wilkes Booth: Day by Day by Arthur F. Loux (2014), Rough Magic: The Theatrical Life of John Wilkes Booth by Deirdre Kincaid (2000), and Lust for Fame: The Stage Career of John Wilkes Booth by Gordon Samples (1982). These texts establish an accounting of Booth’s travels as a touring star while also providing specific details about his engagements in the different cities of the nation. Over the past week, I have completed an update to the Maps section of BoothieBarn. Utilizing the above named sources (specifically Art Loux‘s book), I have been able to mark the location of every theater John Wilkes Booth performed in during his career. Booth acted in a total of 42 different theater venues over his ten-year career, often returning to the same ones for repeat engagements. Of the 42 theaters Booth performed in, only one is still in operation as a theater with at least part of the structure the same as when Booth performed there. That single remaining venue is Ford’s Theatre. The Montgomery Theatre in Montgomery, Alabama was the only other extant theater building John Wilkes Booth performed in besides Ford’s Theatre. It was demolished in 2017. 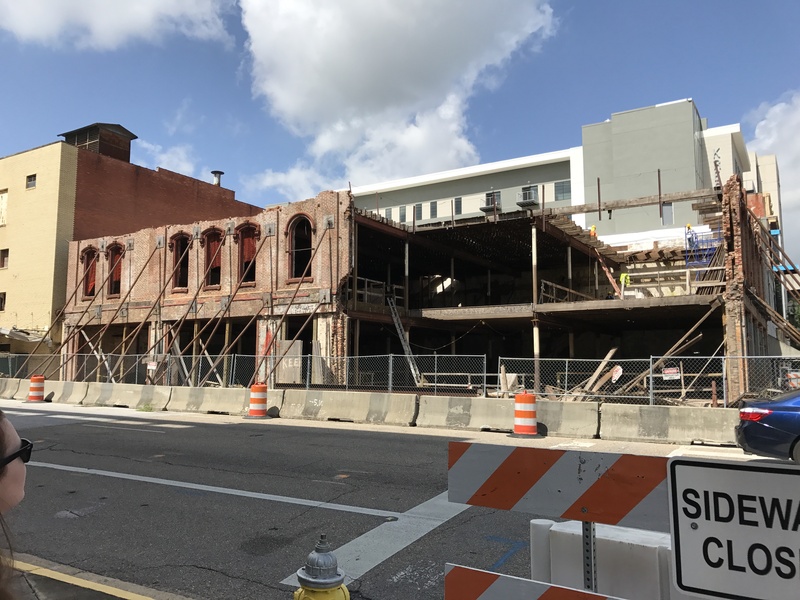 Not only are the vast majority of theaters that once dotted the major cities of the United States during the Victorian era gone, but, for most of them, there is not even a sign to mark where these historic centers of culture and entertainment once stood. Of the 42 venues John Wilkes Booth performed in, for example, only eight have some sort of historic marker or plaque near the site. Still, by using historic maps, city directories, and newspaper records, I have managed to pinpoint the exact location of each of these 42 theaters and provide GPS coordinates for them. The different venues can be found by clicking on or zooming in on any of the Lincoln Assassination Maps that can be found on the Maps page. For ease of use, however, I have created the following table below that gives an outline of Booth’s theatrical career. Clicking on the hyperlinked name of any one of the theaters in the table will open its corresponding map and center it above the theater site. You can then click the pin to get more information about the theater and Booth’s time there. NOTE: After publishing this post, I’ve found that the theater hyperlinks will work without issue on actual computers and on mobile devices / tablets that DO NOT have the Google Maps app installed. If you have the Google Maps app installed, the hyperlinks may not open the maps as described. For IOS (Apple) users with the Google Maps app installed you can still open the maps by pressing and holding one of the hyperlinks lightly for a bit. Then press the “Open in New Tab” option that comes up. After doing this once, all subsequent clicks by you should load the maps in the browser rather than in the Google Maps app (thought you may have to zoom out/in to get the background map to load properly). My apologies for the inconvenience. The table works without issue on a desktop computer. I have divided John Wilkes Booth’s acting career into four parts; his debut, his time as a stock actor, his time as a touring star, and his retirement / conspiracy period. After the table is a brief overview of these parts of John Wilkes Booth’s career. Despite making his debut in 1855, Booth did not immediately go into the acting profession. It wasn’t until two years later that John Wilkes Booth’s career of an actor truly began. Like practically all actors, Booth had to start at the bottom and learn the trade. He signed up as a stock actor in Philadelphia’s Arch Street Theatre. He worked a whole season at the Arch Street getting paid $8 a week. His roles were extremely small with little lines, and he rarely was important enough to be mentioned in playbills or reviews. Still, during this time he was learning the plays and gaining valuable experience from the star actors that would come to the Arch Street for their engagements. When the 1858 acting season began, Booth signed up to be a part of George Kunkel’s stock company of actors which paid him $11 per week. Kunkel’s group was based at the Marshall Theatre in Richmond but would occasionally travel to Petersburg and Lynchburg for engagements. Booth spent two seasons with Kunkel’s group, building his craft and experience. 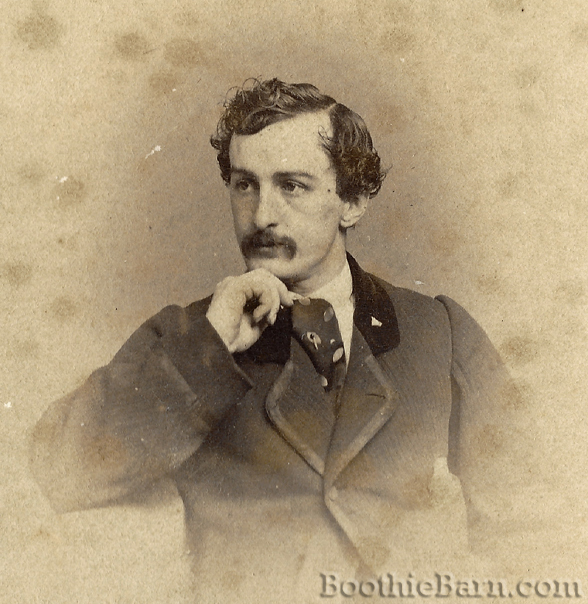 By the fall of 1860, John Wilkes Booth was about ready to strike out on his own starring tour. Though Booth suffered a few mishaps during his first season as a touring star, it was during this period that he reclaimed the name of Booth and started garnering the attention of the theater world. As time went on, Booth’s technique improved and soon he found himself booking engagements in theaters across the nation. Even as a Civil War fractured the nation in two, John Wilkes Booth had no difficulty in finding theaters eager to have him appear. While generally celebrated everywhere he went, Booth found his greatest success in Boston, St. Louis, and Chicago, often returning to those cities for engagements. During the 1863-64 season Booth attempted a schedule of shorter engagements in some smaller cities and, while financially successful, the rapid pace exhausted him. When the acting season ended in May of 1864, Booth set his sights on an easier way to make money: the oil business. His attempt to make money in oil ventures occupied him during the summer of 1864, but he was not successful. It was also during this time that Booth’s mind turned to a devious plot against President Lincoln. John Wilkes Booth did not resume his touring career when the acting season began in the fall of 1864. To his questioning friends and family, Booth said he had become rich in the oil fields of Pennsylvania and no longer needed to act. This was a lie used to cover up his preoccupation on his abduction (later assassination) plot against Lincoln. Booth would perform on stage only two times during the last 11 months of his life. 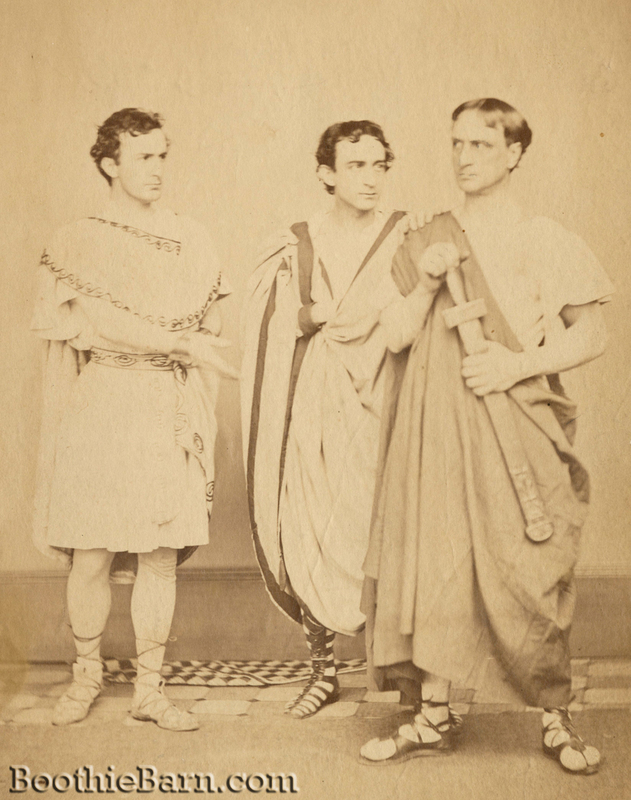 On November 11, 1864, John Wilkes Booth took part in a single performance with his brothers Junius, Jr. and Edwin. Known as the Booth Benefit performance of Julius Caesar, the proceeds of the performance went to the erection of a statue of Shakespeare in New York’s Central Park. Then, on March 18, 1865, John Wilkes Booth made his final stage performance in a production of The Apostate at Ford’s Theatre. The performance was a benefit for his friend, actor John McCullough. Less than a month later, John Wilkes Booth returned to the stage of Ford’s Theatre, this time with a bloodied knife in his hand and a fatally wounded President slumped over in his theater box. For more information about the stage career of John Wilkes Booth, please check out John Wilkes Booth: Day by Day by Arthur F. Loux. Two years ago, Eric Colleary, Curator of Theater and Performing Arts at the University of Texas’ Harry Ransom Center, collaborated with Beth Burns of the Austin based theater company, Hidden Room Theatre, to conduct a staged reading of Richard III based on a promptbook in the collection of the Ransom Center that was once owned and annotated by John Wilkes Booth. The staged reading (which can be viewed by clicking this link) was a great success. Since that time Eric, Beth, and the Hidden Room Theatre company have continued their collaboration and have managed to turn Booth’s promptbook into a full production that will soon take the stage. For those of you who live in the Austin, Texas area, this is a wonderful opportunity to essentially go back in time and experience live theater as it was in the 1860s. Over the past few months, the entire creative team behind the production has conducted in-depth research on theater history and dramatic techniques in order to make this show as accurate to the period as possible. A few days ago, Eric and Beth took part in a fascinating discussion / question and answer session regarding how their collaboration came about and the impressive work being done to bring it to fruition. For those of you who, like me, are no where near Austin, Beth Burns mentioned in the question and answer session that she is hoping one of the shows will be recorded and later made available online. While I am grateful for that, I know a recorded show will not be able to replace the total immersive effect of witnessing it firsthand. Beth also mentioned her hope that this show may live on in the future as an educational tool for college and university theater companies that wish to re-enact theater history. So there is chance Booth’s Richard III could be do a bit of touring if interest is high. Though I know it is a bit of a pipe dream, I, for one, would love to see this show produced by the Ford’s Theatre Society on their historic stage. 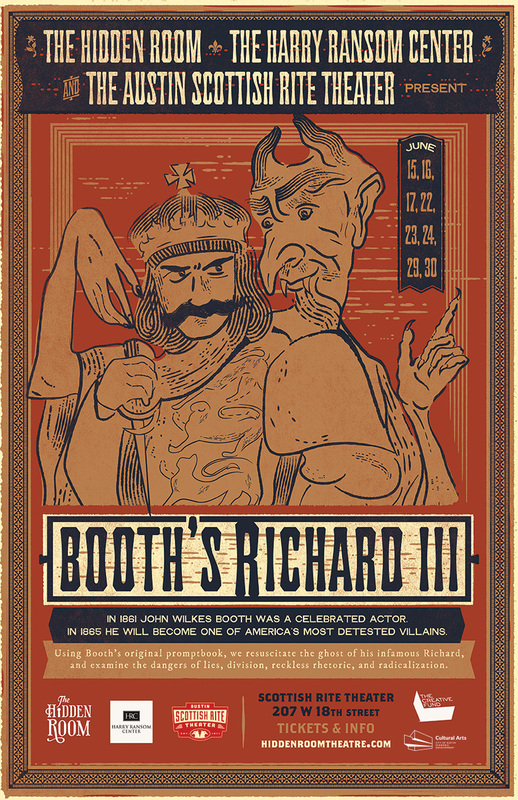 In closing, I would ask that any of you who are able to get to Austin during the show’s run and see Booth’s Richard III to please report back to those of us who were not so fortunate. The comment section will definitely be open. I’d love to hear your thoughts on experiencing 1860s theater just as people like Mr. Lincoln would have.